Some 10 days ago, I wrote a piece "Chinese objection to Indian road projects unacceptable" for NitiCentral (see below). My conclusion was that "There is absolutely nothing wrong in the proposed project to build a road on the Indian side of the India-Tibet border." 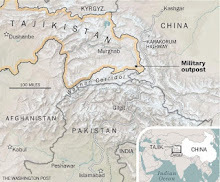 Yesterday, during his monthly press conference, the Chinese Defense Ministry spokesman Yang Yujun again "urged India not to take actions that will complicate the situation on the border, where the two countries have territorial disputes." It was in response to a question about Delhi's plan to build 54 border posts in Arunachal Pradesh ('Southern Tibet area' for Beijing). Yang Yujun said: "We have taken notice of the reports. China and India have disputes over the eastern part of their border. We hope India will try to help maintain stability and peace in the border areas, instead of taking moves that may further complicate the situation." 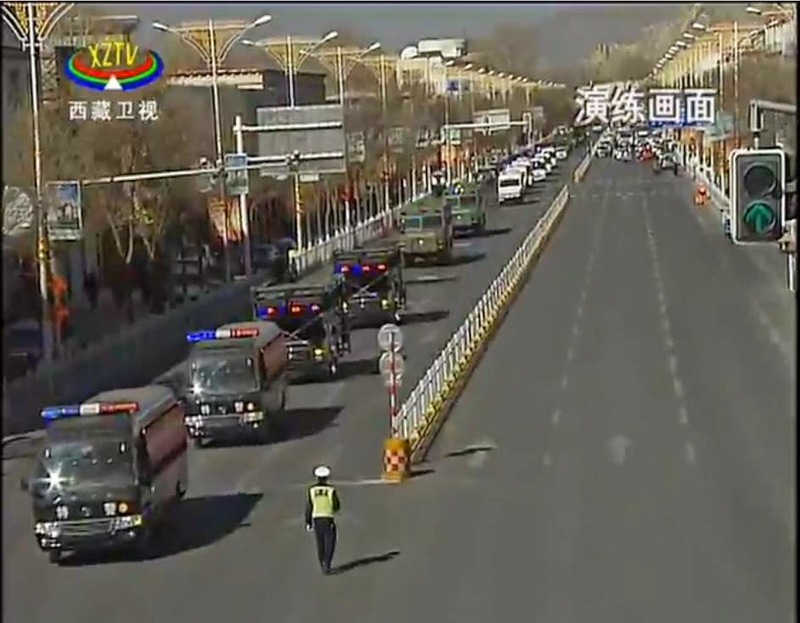 The same day China Tibet Online run a piece on the roads in Tibet. The caption was the same for all the pictures: "An off-road vehicle is running on the well-paved highway with endless grassland on either side in southwestern China's Tibet Autonomous Region". Looking at these pictures, it is clear that the terrain is not the same on the Tibetan side of the LAC than on the Indian. China which has built extremely good roads to the LAC, objects to India struggling to her side of the LAC (for example in Taksing area of Upper Subansiri) where the terrain is extremely difficult. Further, China brings lakhs of Han tourists a few kilometers of the LAC under the pretext to visit the 'most beautiful villages of China' or 'experience' the sources of the Yarlung-Tsangpo (Siang-Brahmaputra). At the same time, India continue to insist on an Inner Line Permit (for Indian nationals) and Protected Area Permit (for foreigners). It is high time for India to open up and live in the 21st century. Not only should Delhi go ahead with the roads to the LAC, but the government must allow tourists to visit these remote and beautiful areas of the Indian territory. China has no business to object. Here are some photos of the roads on the Tibetan side. China is unhappy about India’s plans to build a road on the southern side of the McMahon Line in Arunachal Pradesh. “The boundary issue between China and India is left by the colonial past. We need to deal with this issue properly. Before a final settlement is reached, we hope that India will not take any actions that may further complicate the situation”, Hong said. When one knows the background of the border issue, is this statement not amazing? Who created the complication in the first place? The answer is China, when it invaded Tibet in 1950. Till then, India had had a peaceful neighbour and there was no border ‘dispute’ between India and Tibet (or when there was, it was discussed, without using force). 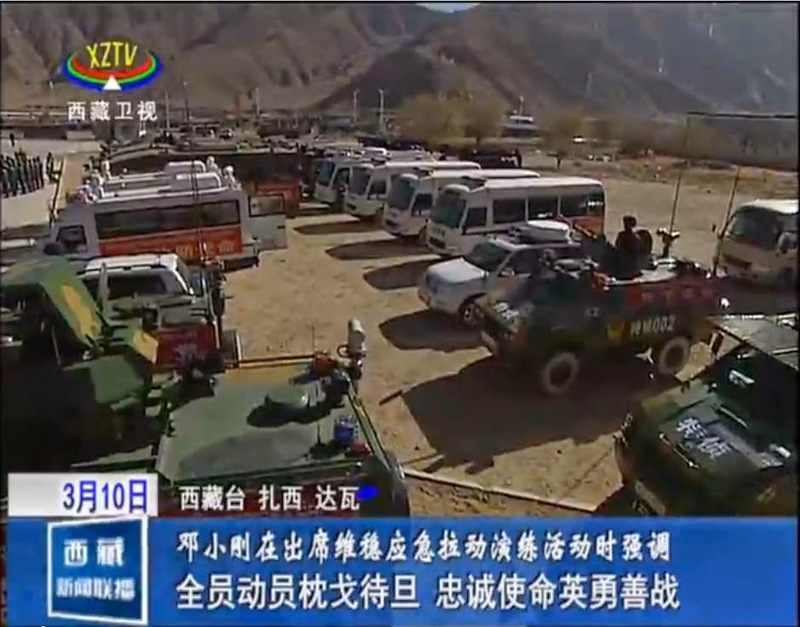 The Chinese spokesperson now says: “We should jointly safeguard peace and tranquility of the border area and create favourable conditions for the final settlement of the border issue,” but why did China need to ‘liberate’ Tibet in the first place? Why did it build a road on India’s territory in the Aksai Chin in the 1950s? This indeed complicated the issue manifold, didn’t it Mr Hong? 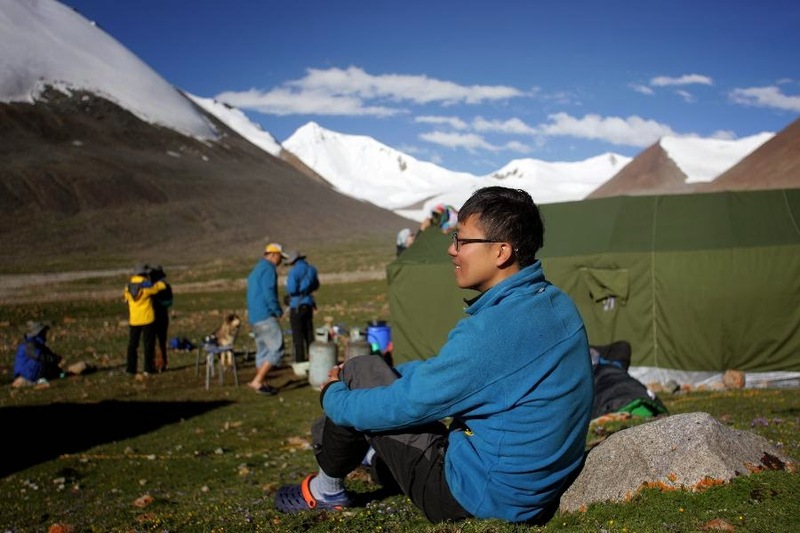 There is absolutely nothing wrong in the proposed project to build a road on the Indian side of the India-Tibet border, as announced by Kiren Rijiju, the Minister of State for Home Affairs. It is too easy for China to always put the blame on India. With Rijiju, every Indian can rightly hope that the construction of the 1,800 km long road could begin soon. One could also ask Mr Hong: What about the Qinghai-Tibet and the Sichuan Tibet highways which in the 1950s changed the military and strategic stakes on the plateau? Was it not a complication for India? It was indeed crucial for Mao’s troops to occupy the Tibetan plateau and come closer to India’s frontiers. To understand better the situation, one should read the 1952 Annual Report from AK Sen, the India Consul-General in Lhasa. Without these roads, Tibet would have starved (like it did in 1952-1953) and the Chinese occupation of the plateau was impossible. The occasion was seized by the Chinese to implicate the Prime Ministers as instigators of the move. Ultimately, the two courageous Prime Ministers, Lukhangwa and the monk Lobsang Tashi were forced to resign. 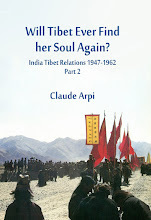 It was the beginning of the end of ‘independent’ Tibet and more ‘complications’ for India as nobody had the courage to oppose the Chinese anymore in Lhasa. Communist China began to expedite the construction of roads leading to Tibet (from Qinghai and Sichuan) in order to feed their occupying armies (to ‘liberate’ Tibet, in Communist jargon). The Chinese, who had come to ‘liberate’ the ‘masses’ (with the cowardly support of many in the aristocracy), began punishing the ‘masses’ which had dared protest. And for some time …India started supplying rice to the PLA soldiers stationed in Tibet. Now, China is not satisfied with its highways, Beijing has decided to build an ‘expressway’. 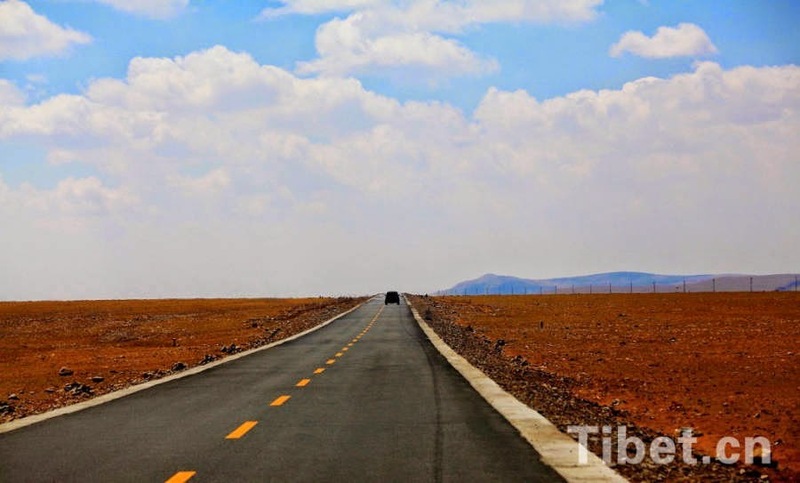 Wang and his team believe that the main technical barrier lies in the 500-km frozen earth belt along the planned 1,900-km expressway that links Lhasa with Qinghai’s provincial capital Xining. China already ‘complicated’ the situation for India by bringing the train to Lhasa in July 2006 (and now to Shigatse); the express-highway from Xining to Lhasa will further tilt the strategic balance. ‘War road’ refers to the Manchu invasion of Nepal in 1792. The train to Kyirong will open the gates for millions of Chinese tourists to invade Nepal. A great danger for India considering the porous India-Nepal border. But that it not all, to complicate the situation further, Beijing plans to invest 278 million yuan (US $ 45 million) for expanding the Mainling (Nyingtri) airport. The Central Government has already allocated 139.5 million yuan (US $ 23 million) and the balance will be provided by the civil aviation development fund. 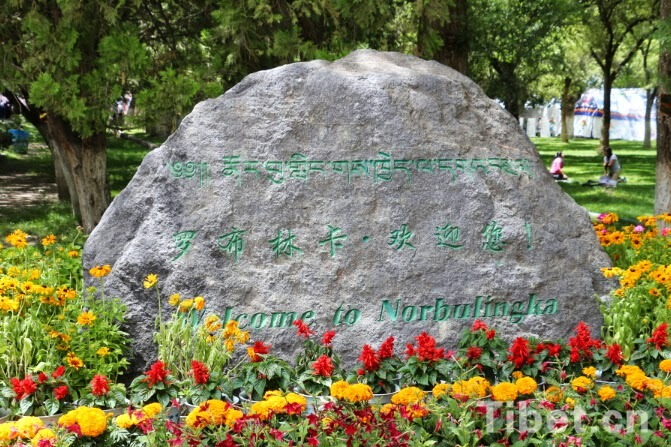 In the first half year of 2014, Nyingchi has already received 836,200 tourists. 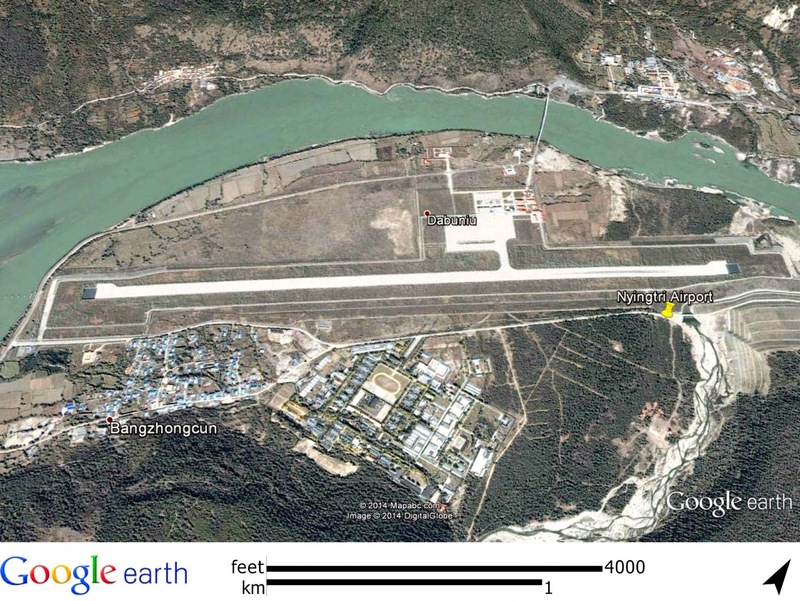 The airport is built on the banks of the Yarlung Tsangpo (Brahmaputra), just north of the McMahon Line. This airport is located just north of the McMahon Line. The Nyingtri Development and Reform Commission announced that, from January to September 2014, the Nyingtri/Mainling airport transported 246,611 passengers, up 17.5 per cent from the same period in 2013. For India, it is extremely worrying and it definitively complicates the situation on the north-eastern frontiers. The train to Nyingtri in 2020 will further exacerbate the border row. Has Beijing consulted Delhi before finalising the plans? Of course, not! And then, the train to Chumbi Valley, near Sikkim! India is indeed facing a complicated situation …entirely due to China’s bullying attitude. More Tibetan refugees in Nepal? What was Lobsang Gyaltsen, the Chairman of the Tibet Autonomous Region's (TAR) government doing in Kathmadu? 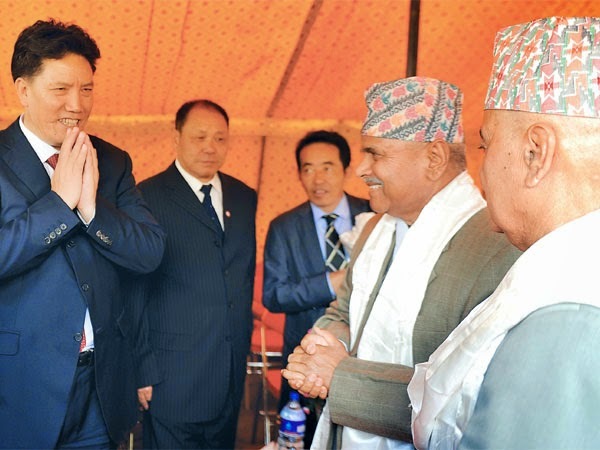 According to the E-Kantipur, "Tibet region chief stressed better ties in security". One funny thing, the Nepali media calls him 'Luo Sang Jiang Cun', it is the Chinese way to spell Lobsang Gyalsten's name! Others write Luo Can! Gyaltsen (Mr. Luo, for the E-Kantipur) apparently urged Kathmandu "to put in place measures to curb 'anti-China activities' in Nepal." Leading a six-member 'Tibetan' delegation to Kathmandu, Gyaltsen met with Deputy Prime Minister and Minister for Home Affairs Bam Dev Gautam and Minister for Foreign Affairs Mahendra Bahadur Pandey. "Bilateral issues including Tibetan assistance to bordering Nepali districts figured", says the Nepali paper which note that 'Luo' did not utter the word ‘refugee’ while speaking about his countrymen who have taken refuge in Nepal, but he repeatedly spoke of 'anti-Chinese elements'. He sought a better coordination between security agencies on both sides of the international border to curb such 'Tibetan' activities. Home Minister Bam Dev was quoted as saying: “The Chinese side seems worried about increasing criminal activities along the Nepal-China border". Why is Lobsang Gyalsten so obsessed with his countrymen activities in Nepal? It is probably due to the forthcoming opening of Kyirong landport between Nepal and Tibet. A few weeks ago, the official China Tibet Online reported: "The Gyirong [Kyirong] Port in southwest China’s Tibet bordered with Nepal will be formally opened in October this year. The opening of the Gyirong Port has been listed in the key work plan of national ports in 2014." The website had also announced that a cross-border China-Nepal Gyirong Port Economic Cooperation Zone to be soon established; further the Gyirong Port will become a tourist destination for Han Chinese (not Tibetans). One of the consequences of the opening of a new port between Tibet and Nepal could be the escape to Nepal of Tibetans resenting the Chinese rule.Gyaltsen told the Nepali ministers: "China doesn’t have any refugee as such”, but those crossing the border into Nepal are doing it illegally. The ministers politely assured the Tibetan leader that the Nepali soil would never be used against its neighbours, i.e. China. Gyalsten, with his one-point agenda, also called on President Ram Baran Yadav, Prime Minister Sushil Koirala and Minister for Culture, Tourism and Civil Aviation Dipak Chandra Amatya. Gyaltsen also discussed "possible Tibetan assistance to 15 northern districts of Nepal." A Foreign Ministry official said there are indications that from next year, the Tibetan government will expand the cooperation in this field. The present cooperation is mainly centered around security and the training of the Nepali border guards to catch the Tibetans who would try to escape Tibet. 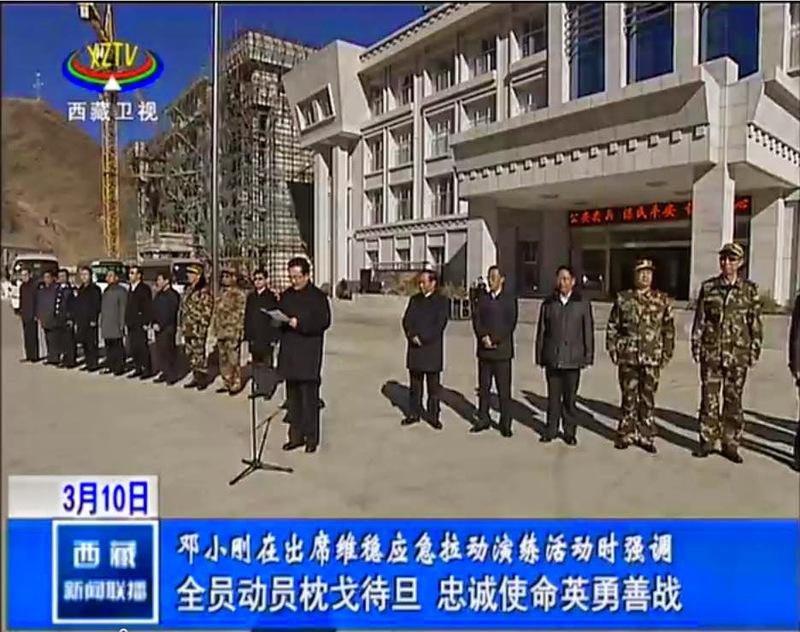 It remains that the opening of Kyierong landport on a large scale makes Lhasa (and Beijing) nervous. It was the only purpose of Mr Luo's visit to Kathmandu to tell the Nepalis to watch out and not accept more 'refugees'. Already in July 2010, a meeting termed ‘Nepal-China Border Security and Law Enforcement Talks’ was held in Kathmandu. Both sides had agreed to set up ‘focal points’ in the respective Home Ministries in Kathmandu and Beijing. A senior Nepali Government official told The Kathmandu Post: “The Chinese side assured full support to enhance capacity building, training of Nepali security personnel to be deployed across the northern border, seeking Nepal’s full commitment on information sharing on anti-China activities with effective law enforcement mechanism to contain the activities. In August 2011, an unnoticed development took place. Zhang Qingli, the then hardliner Party boss in Tibet, accompanied the Politburo Standing Committee member, the now disgraced Zhou Yongkang to Nepal. Zhou was then the supreme security czar of the Middle Kingdom. Lhasa is indeed nervous that more 'refugees' could cross the border to Nepal and then proceed to Dharamsala. By the way, do you know how Google Language translates 'Lobsang', alias 'Luo Can', you will not believe it, 'Lausanne'. The sound is not too different. I had a Tibetan friend called 'Lobsang', I used to call “Love Song”, that is even better. The Deccan Chronicle (DC) reported that 'Chinese PLA now targets Taksing zone in Arunachal Pradesh'. Two years ago, I mentioned on this blog the Chinese intrusions in Chaglagam circle of Anjaw district of Arunachal Pradesh. This time the incursions occurred in the remote circle of Taksing in Upper Subansiri district. The DC says: "After the recent Ladakh incursions, frequent intrusions by China’s People’s Liberation Army (PLA) in Arunachal Pradesh’s Taksing region have come to the notice of the security agencies. 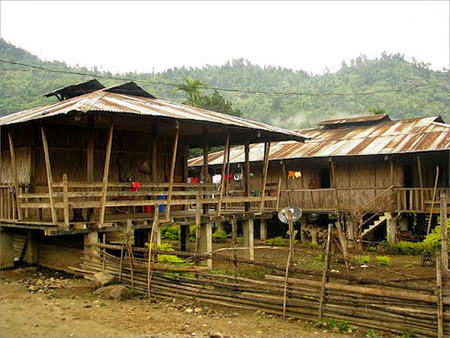 The villagers of Taksing circle in Upper Subansiri district took photographs of the PLA crossing over the Asa-Pila-Maya Army camps, which were Indian territory till 1962, but now under Chinese occupation." The report continues: "Security sources also confirmed this incursion had come to their notice about a month back, but the PLA had gone back after a brief stay." What is more surprising is that the issue was not taken up during a flag meeting held between Indian and Chinese armies at Kibithu in Anjaw district on Diwali Day. According to the DC: "security sources said this particular incursion did not come up for discussion." The Deccan Chronicle quotes Hiwak Chader, a student from Kacha village of Taksing circle who said the local people noticed "the movement of Chinese troops in the Asa-Pila-Maya area around three months back, but the government was not aware about it before the villagers handed over photos to Army Intelligence and IB sleuths." Interestingly, the report admits that it is the local Arunachalees who are not only keeping a close watch on Indian territory, but also acting as intelligence officer for the Indian Army and IB. Chader affirms that it is often the local villagers of Taksing area (Tagin tribe?) who are guarding and defending Indian territory in Taksing circle. The student leader believes that "time has come that government should take a realistic approach to demarcate the land-border with China which was expanding its territory in many areas". The fact is that there is no proper road between Limeking (the adjacent circle) and Taksing. One can only hope that it will be taken on 'war-footing' by the Central and Arunachal authorities. Incidentally, Taksing was the last Indian village on the Dakpa Sheri (Cristal Mountain) parikrama while Tibetan pilgrims were returning to Tibet. Pilgrims used to perform the sacred Rongkor pilgrimage every twelve years. 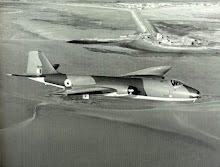 I copied here a few paras of my book 1962: the McMahon Line Saga. My map is not very accurate, Taksing is closer to the international border than shown. A remarkable book has been written by Maj. S.M. Krishnatry (of the Indian Frontier Administrative Service) about the last pilgrimage in 1956, it is called Border Tagins of Arunachal Pradesh: The Unarmed Expedition of 1956. Every Indian should read it to understand the difficulty of the terrain and the lack of progress since 1956. Between the first wave of Chinese troops arriving in Tibet in 1950, till the next Monkey Year (1956), the time for the next Rongkor, the Chinese had begun occupying most of the strategic axis in Tibet and had come closer to the Indian border, i.e. the McMahon Line. It has to be noted that at the time, the Tibetans were aware that the Government of India meant business, especially after Major Bob Khathing occupied the Tawang area . Elsewhere also in NEFA, the Indian administration was also pushing towards the Line. Apparently the 1956 Rongkor and Lodzong [pilgrimage] passes off peacefully with few noticeable incidents. However, it is almost certainly the fact that a vigorous decade of Indian administrative contacts had already either broken the spirit of the upper Subansiri tribes or made conditions too inconclusive for them to attempt any aggravation of their northern neighbors and risk a political incident during this increasingly critical period of Tibetan, Indian, and Chinese relations. As we shall see during the August 1959 incident at Longju, the Indian Army (or Assam Rifles) had already set up posts near the not-yet disputed border. For the first time, the 1956 Rongkor saw the presence of ‘foreigners’; the Chinese PLA camped in the Mandala Plain of Tsari from where the Pilgrimage starts. But the Chinese kept their participation rather discreet, merely providing medicines for the pilgrims. Only three years after the last Pilgrimage, the hostilities started, but with new actors; it was no longer the Tibetans vs. the local tribals of the Upper Subansiri and Tsari Chu, but the Indian and Chinese States. Here is a report published in The Tibet Daily on the visit of Guo Jinlong, a member of the Politburo who was in Tibet between October 15 to 18. The news has not appeared in the English-language Chinese press. It was not only one of the most important visits of the year, but it took place just before the crucial Fourth Plenum of the 18th Congress which discussed 'the rule of law' in China. Are the two events linked? The timing of the visit is also surprising because Guo, as Beijing Party Secretary is responsible for some of the arrangements for the forthcoming APEC meeting. He may have come to 'learn from Tibet': how to have a clear blue sky during an important function!! Three other members of the Politburo ‘inspected' Tibet during the last 4 months (General Fan Changlong, General Xu Qiliang and the security boos, Meng Jianzhu came earlier). What is interesting is that Guo Jinlong served more than 10 years in Tibet and was Party Secretary in the Tibetan Autonomous Region (TAR) between 2000 and 2004. During his visit, Guo spoke of thoroughly implementing the decisions of the Central Work Forum on Tibet (held in January 2010) and mentioned the importance of the 20th anniversary of the Aid Tibet program. The Politburo member was accompanied by all the TAR big bosses: Party Secretary Chen Quanguo; Padma Choling, Chairman of the TAR People's Congress; Lobsang Gyalsten, the Chairman of the TAR’s government; Wu Yingjie, deputy secretary and Deng Xiaogang, secretary of the Politics and Law Committee (and also deputy secretary). As he arrived in Lhasa, Guo Jinlong was escorted by Chen Quanguo and Padma Choling to the residence of the old CPPCC Vice Chairman Pagpalha Delek Namgyial (Rinpoche). Guo formally briefed Pagpalha about Beijing support to Tibet. Pagphala remains a father-figure in Tibet, though he plays only a ceremonial role in the Party today. The next day (October 16), the Beijing delegation visited the Lhasa Beijing Experimental High School. In September, the first group of students joined the institution. The school facilities are said to favorably compare with a middle school in Beijing; Beijing has sent teachers and the management from Beijing “so that students can enjoy Tibet quality educational resources”. Guo Jinlong had a cordial exchange with the teachers and students: “I hope that the students learn the knowledge to serve the motherland,” he told them. 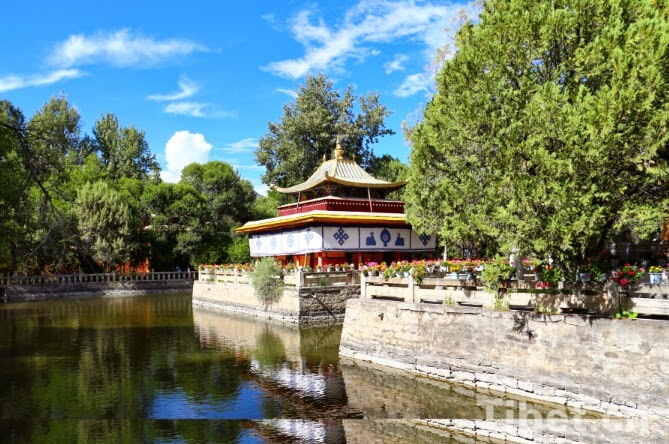 Beijing also funded Lhasa cultural and sports center with a total investment 735 million yuan; it is the largest engineering project funded by a province; it has greatly improved the local sports facilities of the Tibetan capital, says The Tibet Daily. 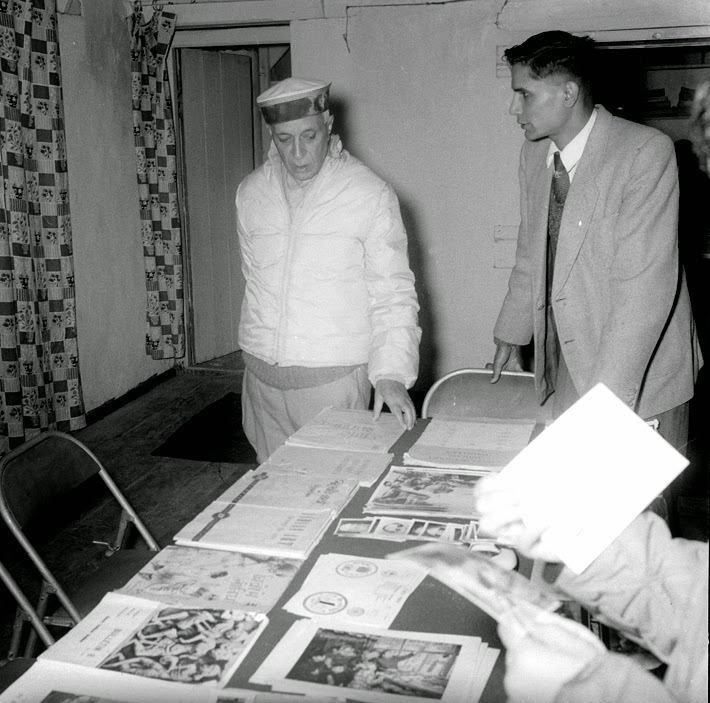 Later in the day, Guo Jinlong inspected the stadium, gymnasium as well as the Yak Museum and a children's playground. 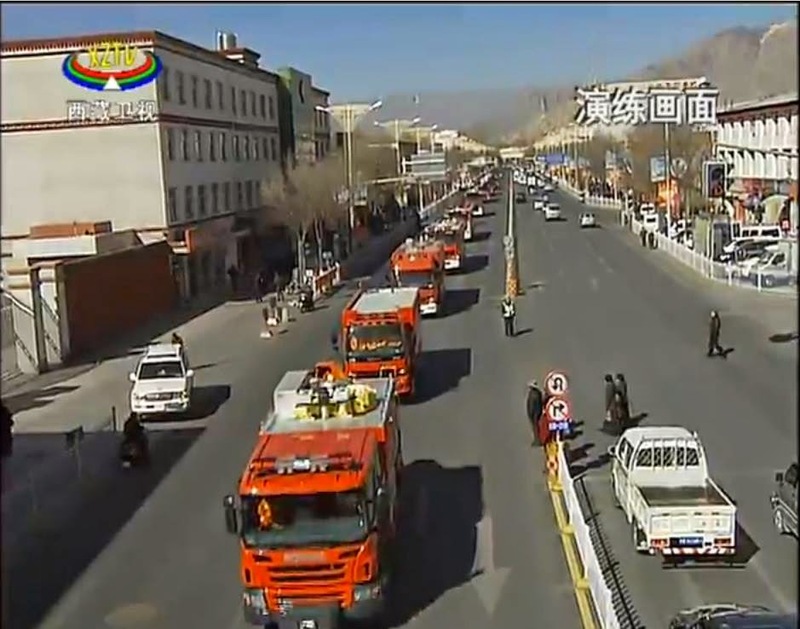 The local press reported that Beijing has adopted Tamar Village, in Chengguan District of Lhasa Prefecture and invested 13 million yuan for proper pavement, installation of lighting facilities, water supply, etc. Then the Beijing delegation visited the new campus of the Tibet University, the Lhasa Urban Planning and Construction Exhibition Hall and the Potala Palace Square police station. All dignitaries have to visit this Police Station. It must be particularly well kept. On the 17th, Guo Jinlong and Chen Quanguo took a ride on the train to Damchung County (North of Lhasa); Guo met nomads who have apparently been resettled near the National Highway. Beijing spent 30 million to reconstruct local houses for the project, “so they lived on a spacious two-story, in addition to raising yaks”. 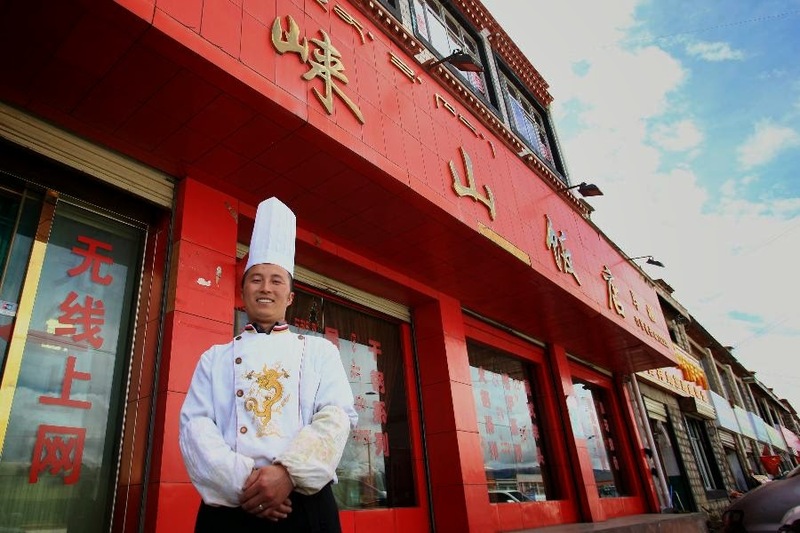 The Tibet Daily reported that one of the Tibetans, that Guo met, ran an outside transport company and get two three hundred thousand yuan annual income from his new occupation. I have discussed elsewhere the horrendous scheme to ‘park’ nomads in cubic houses. Nomadic life was probably not ‘scientific’ enough. Guo also visited Damchung County People's Hospital, where more than half of doctors come from Beijing (since 2007 Beijing has sent 19 doctors to work in this hospital). Guo spoke highly of the doctors in Tibet “who are not afraid of hard work, who are willing to sacrifice the life.” He told them to reasonably rest and to take care of themselves. He said that he was happy to return to Tibet ten years later and see by himself the sustained and healthy economic development which has taken place; the great improvement of the infrastructure; that the people's life has significantly improved; the construction of an ecological civilization is remarkable, he added. He sincerely admired the sustained overall social harmony and stability of Tibet, and was happy to see the results of the ‘reform and development’ program. 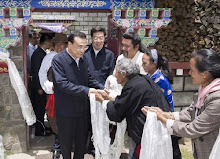 He added that he deeply felt that these achievements demonstrate the successful practice of solving ethnic issues with Chinese characteristics; Tibet is on the right path, he concluded. Addressing a Forum, Guo Jinlong quoted President Xi Jinping. First, we (Beijing and Tibet) should work together to build the roof of the world; work together to maintain stability of this 1.2 million square kilometers sacred territory. Third, one needs to promote Aid Work (with Beijing and other provinces) with the same standards than the capital city. One needs to adhere to a high starting point, to have high-level planning, quality construction, to make aid work stand the test of history and the people, he argued. Fourth, you should serve the Tibetan people heart and soul. Get things done with your heart, so that it will benefit people of all nationalities. Guo affirmed that on the occasion of the 20th anniversary of Aid Program, he wanted to open a new era for Beijing Aid Work. First, focus on improving the livelihood of the people; adhere to the support of the grassroots, of the farmers and herdsmen; focus further on their education, employment and health care, so that the masses directly benefit (from the Aid Work). Second, Guo asserted, “we should build a moderately prosperous society by doing Aid Work; deepen the introduction of technology in Tibet; encourage and support collaborative innovation; promote scientific and technological achievements for Tibet; increase industrial efforts to support the development of tourism and culture, health and ‘Pure Land’ industries (mineral water bottling?)." He argued: "Tibet needs to take advantage of its own characteristics and utilize this to help local industry to brand ‘Tibet’ in order to expand its own market." 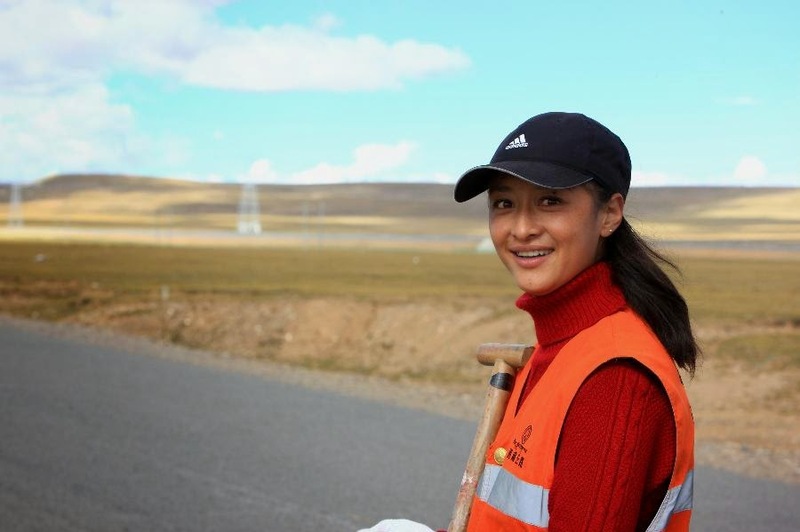 Third, focus on infrastructure to do Aid Work; focus on improving transport infrastructure to facilitate the travel of the masses; to support the construction of drinking water safety in rural and pastoral areas, so that the people drink safe water; actively participate in Lhasa urbanization work to help grasp the transformation of old villages and housing construction, so that more people of all nationalities enjoy the results of leapfrog development. Fourth, blend well with the rest of the nation through contacts and exchanges; increase cultural links and strengthen the protection of Tibetan culture, promote cooperation and exchange, etc., to promote rich cultural life of the people of all ethnic groups; promote the ‘Beijing Tibetan family’, he empathized. Guo also said that one should have a high political consciousness, to establish long-term mechanism and then pay close attention to implementation of the tasks. Beijing follows the central demands, to do the work of their counterparts in Tibet to further strengthen exchanges and cooperation between the two provinces, and strive for Tibet and support leapfrog development and long-term stability. Chen Quanguo extended a warm welcome to the delegation and thanked Beijing for its old, strong and selfless support. Chen Quanguo said in recent years, following the orders of Xi Jinping, "Tibet continued efforts to achieve stable, long-term stability, and overall stability". Chen Quanguo pointed out that Beijing has always attached great importance to Aid Work, Beijing's assistance to Tibet is an important political responsibility. During the forum, Beijing Municipal Committee, vice mayor Li Xiang also spoke while Lhasa Party Secretary, Choedrak gave a description of the economic and social development of the Tibetan capital. On the 16th, Guo Jinlong listened to reports and gave another speech ...with Chinese characteristics. All this sounds nice, but is the reality matching with the speeches is another question. My article Reforms in academic research, scholarship appeared in the Edit Page of The Pioneer today. As India prepares to celebrate the 125th birth anniversary of Jawaharlal Nehru, the incumbent Prime Minister of India, Mr Narendra Modi, announced that he will head the national committee to commemorate the occasion. A Prime Minister’s Office release said the first meeting of the committee will be held “soon after Deepawali”. The media was surprised as no one from the Nehru-Gandhi family was included in the committee which has six Cabinet Ministers; however senior congress leaders such as Mr Ghulam Nabi Azad, Mr Mallikarjun Kharge and Mr Karan Singh have been called upon to participate. A host of other eminent academics, scholars, retired bureaucrats and Army officers will take part in the deliberations of the committee, which will also have the Director General of National Archives of India as a member. It is an interesting inclusion, though the fact that there is no permanent DG since professor Mushirul Hassan left in May 2013, shows the lack of interest of the previous Government for scholarly work and research. Hopefully, this will change under the new dispensation. The Nehru celebrations would be the ideal occasion to open up to research, what is known as the Nehru Papers (also referred to as the JN Collection) kept in Teen Murti Bhavan, and this without any restriction. It has been one of the greatest enigmas of ‘modern’ India: How come the correspondence, notes, speeches of the first Prime Minister of India are considered ‘private’ and why should it be kept under the custody of one ‘private’ person (Ms Sonia Gandhi)? The state’s papers should never be privatised. Apparently, Nehru had willed all his papers to an organisation to be created after his death (the Jawaharlal Nehru Memorial Fund). However, Nehru did not specify that thereafter, special permission of the custodian would be required to access any file/document. Apparently, his daughter, Indira Gandhi, added this odd rule that they should remain in the custody of her family. 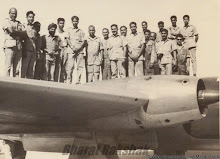 The end result is that the Nehru Papers do not come under the Public Record Rules, 1997, which states that records that are 25 years or more must be preserved in the NAI (and that no records can be destroyed without being recorded or reviewed). While legally, it is mandatory for each Government’s department to prepare a half-yearly report on reviewing and weeding of records and submit it to the NAI, the Nehru Papers are exempted. It would be fine to keep the Papers as a ‘collection’, if they were openly available to the general public. The Nehru Papers are an invaluable collection dealing with all topics under the Indian sky, looked after by the Prime Minister (Nehru was also Foreign Minister from 1947 till his death in 1964). One can argue that the JN Collection is not completely closed; if one is ready to follow the cumbersome process and write to the 'custodian', one has technically a chance to have a darshan of the said file/letter. But why to always complicate the researcher's life? One can hope that the committee for the 125th anniversary of Nehru will put this issue first on its agenda and as an offering to the memoirs of the first Prime Minister, will make his fabulous collection of historic documents available to each and every one in India (and abroad), wanting to study Nehru’s works. It can be argued that the Nehru Papers have been partially declassified through the publications of more than 55 volumes of the Selected Works of Jawaharlal Nehru (1947-1960), but for a researcher, this selection cannot replace the ‘real thing’. Further, though the policy has been changed for the most recent volumes, the editor used to resume with a few words the letter/event/note which had triggered the Prime Minister’s answer; to read Nehru's interlocutor full questions/queries helps to better understand Nehru’s answer. The newly-appointed committee would do India a great favour in opening the entire collection to the public. It is not only in the medical field that research should be supported, but in the historical one too. Young (and older) Indians should be encouraged to research and dig in the past (the glories as well as the goof-ups) in order to better face today's reality. Let me tell you my personal experience in the National Archives of India which I have been frequenting for the past 15 to 20 years. Every two years, I have to re-apply from scratch and prove again that I am still a ‘scholar’. Being born in France, I have to bring a certificate from the French authorities ‘proving’ that I’m still a ‘researcher’. Though the French Embassy has always readily obliged, why can’t I be a ‘scholar’ for life? When I ask the NAI staff, I am invariably told: “No sir, this is the rule in India’ you can be a scholar for two years only.’ What a nonsense! If the Prime Minister wants to build a nation of researchers, there are many rules to drop and many vaults to open. Today, a string of antiquated rules and regulations, red-tapism and an obscurantist mind-set not worthy of a dynamic country like India, remains in place. As a result, Indian history continues to be buried. Is it the hallmark of a mature nation? Please, Mr Prime Minister, encourage historical research too. Who is Living Buddha Number One? Xinhua recently reported that "the 11th Panchen Lama, Bainqen Erdini Qoigyijabu, [Panchen Gyaltsen Norbu] concluded two and a half months of religious activities in southwest China's Tibet Autonomous Region and returned to Beijing." The young lama selected by Beijing (the Dalai Lama's candidate has been under house arrest for nearly 20 years) pays every year such a visit to Tibet. 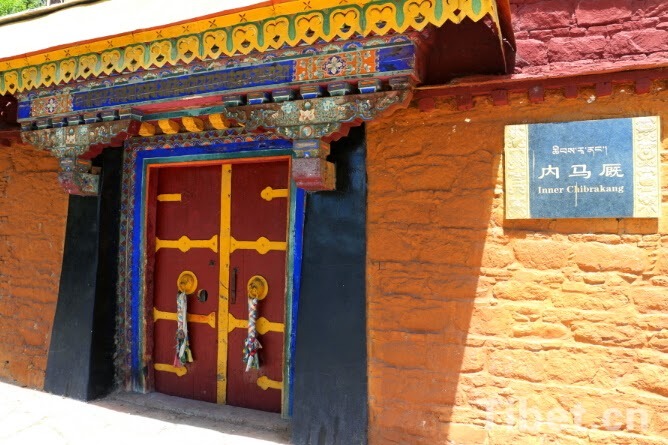 This time he spent more time in 'his' Tashilhunpo monastery in Shigatse. But what was most interesting were Xinhua's comments : "Bainqen Erdini Qoigyijabu, one of the two most revered 'Living Buddhas' in Tibetan Buddhism, left Tibet on Monday after giving blessings and presiding over a series of religious rituals at several monasteries in Xigaze [Shigatse] Prefecture." Though the communique speaks of 'two' revered Living Buddhas, only the Panchen Lama's name is mentioned. It is left to you to guess who is the second, whose name (and photo) are banned in Tibet. Why to mention 'two' Living Buddhas, if the existence of the second one is not even acknowledged on the Plateau? What an irony! While the Dalai Lama lives in the heart of each and every Tibetan, his name cannot be printed in Tibet (and China). 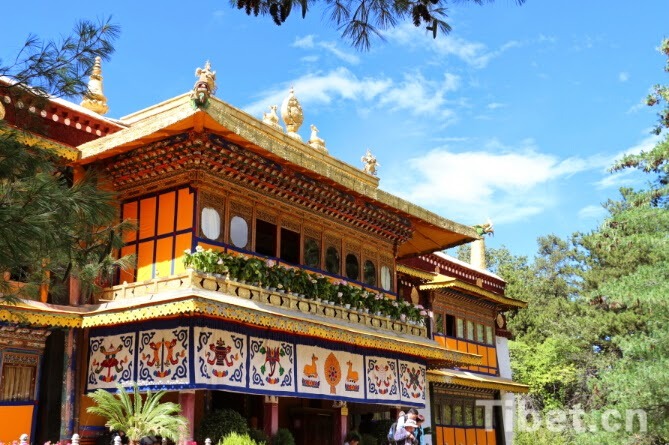 Another example, China Tibet Online just published a series of beautiful photos of the Norbulingka, the Summer Palace of the Dalai Lama in Lhasa. 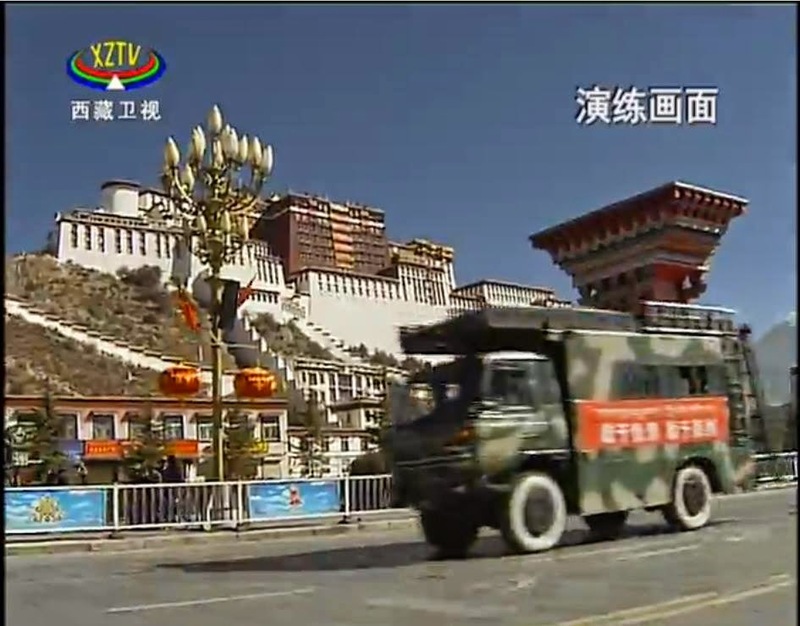 The caption reads: "Norbulingka meaning 'Treasure Park' in Tibetan, is one of national key cultural relics protection units. 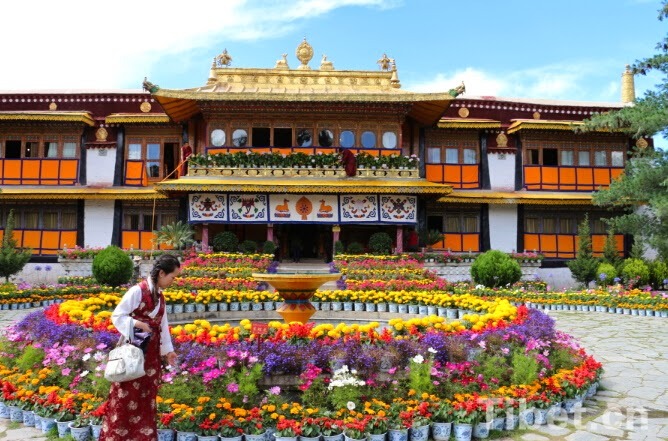 Situated in the western suburb of Lhasa city, Norbulingka Summer Palace covers an area of 360,000 square meters with more than 100 kinds of plants in it." Whose Palace it is, is not mentioned! The name of the Palace's owner is banned! In the meantime, Chinese cadres have started studying Tibetan Buddhism. Can you believe it? 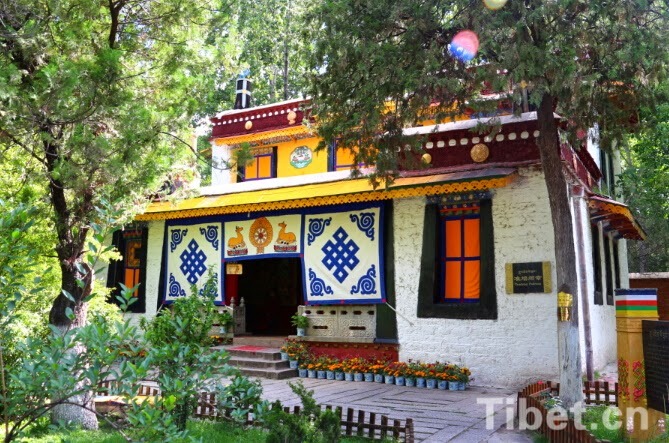 China Tibet Online announced that on October 20，a seminar on the doctrines of Tibetan Buddhism was held at the China Tibetology Research Center in Beijing. The theme of the in-depth discussion was 'Tibetan Buddhism and Equality'. It was a two-day seminar sponsored by the China Tibetology Research Center and the High-level Tibetan Buddhism College of China. Lhagpa Phuntshogs，the director-general of the China Tibetology Research Center explained that "the seminar is aimed at promoting Tibet’s economic and social progress by giving a full play to the role of religious figures and followers. 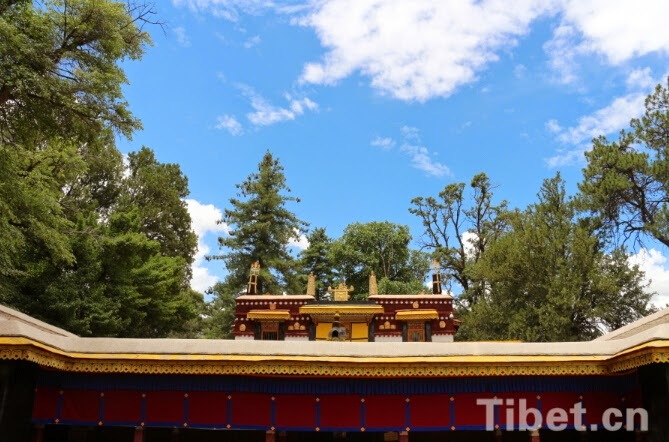 It is the key subject for furthering the sound development of Tibetan Buddhism in the new century and an important channel to adapt Tibetan Buddhism to socialist society." Of course, 'giving full play to the role of religious figures' is understood minus Monk Number One. The seminar's objectives were to integrate Buddhism and Marxism. The communique says: "the Tibetan Buddhism doctrine is mainly focused on discovering, summarizing and advancing the fine traditions of Tibetan Buddhism, and integrating the idea of progress to serve the society and the people." The seminar promoted books on four themes such as patriotism，belief in Tibetan Buddhism，establishment of the ethnic standard and commandment, and harmonious progress, for the country，the people and the religion. But was not an ordinary religious teaching for Chinese citizens turning towards spirituality, as the research group participating to the exercise will submit the outcome of its research to the Communist Party. The organizers says: "Over 70 people attended the meeting, including leaders of the United Front Work Department of the CPC, revered lamas of the Tibetan Buddhism, scholars and experts in the area of Tibetan Buddhism research, leaders of the departments concerned of the Tibet Autonomous Region as well as the sutra teachers and students of the 12th 'Tho Ram Pa' [Geshe Lharampa students, equivalent to a PhD in Buddhism]." In other words, senior Party cadres are learning Buddhism ...without, of course, ever referring to Living Buddha No One. 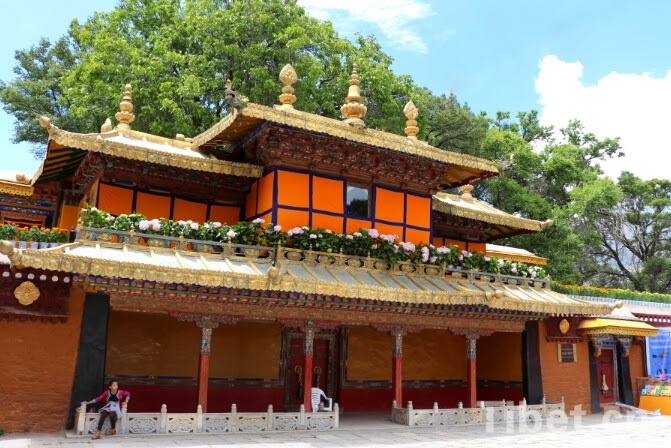 In the meantime, envoy pictures of the Dalai Lama's Summer Palace, the Norbulingka. Who wants to unify under the central leadership? Yesterday, The South China Morning Post reported that a directive had been issued by the Party “for higher education entities to unify under the central leadership”. The ‘directive’ was released by the General Office of the Communist Party of China. It says that after the fourth Plenum of the 18th CPC Central Committee (to be held next week) “all departments at universities across the country shall conscientiously make implementations that adhere to the party’s leading core position”. You can understand why the students in Hong Kong are increasingly nervous about the 'One Country' scheme, in which the 'Two Systems' will go to the trap. He does not even speak anymore of 'Two Systems'. Very surprising is the silence of the Tibetan Administration in Dharamsala, which has kept completely quiet. Perhaps they have also become believers of ‘One Country’! But it is simpler than that: the Hong Kong students are just fighting for their freedom of speech, of thought, for their future. Last month, in an editorial in the Party Journal, Qiushi (‘Seeking Truth’), it was announced that Peking University had directed its students and professors to “fight against speech and actions that criticise the Communist Party”. It is what might happen to the students in Hong Kong in a few years from now, as ‘One Country’ will always prevail on ‘One System’. It is what the Hong Kong students do not want to happen in 5 or 10 years time. 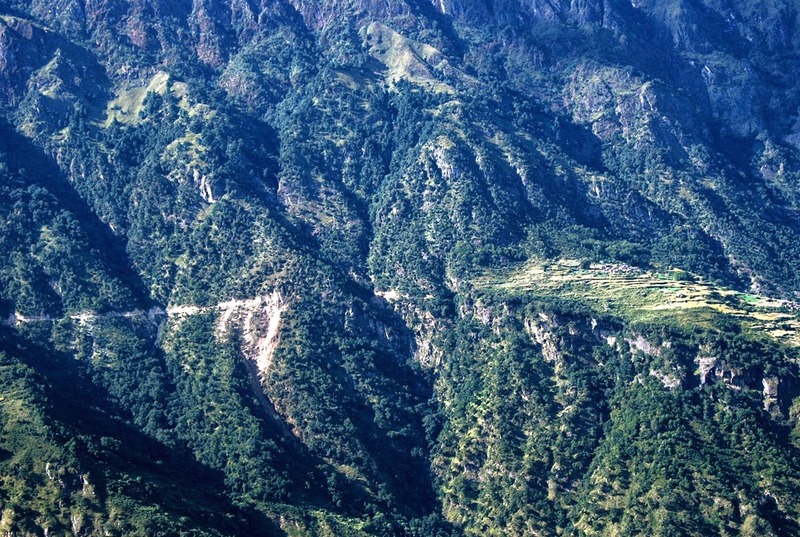 They are unhappy about India’s plans to build a road on the southern side of the McMahon Line in Arunachal Pradesh. "The boundary issue between China and India is left by the colonial past. We need to deal with this issue properly. Before a final settlement is reached, we hope that India will not take any actions that may further complicate the situation”, Hong said. The proposed billion-dollar project on the Indian side of the India-Tibet border was announced by Kiren Rijiju, the Minister of State for Home Affairs during a visit to his home State. One could ask Mr. Hong: when China decided to build a road through the Aksai China plateau in the early 1950s, was not Beijing ‘complicating’ the issue with India. 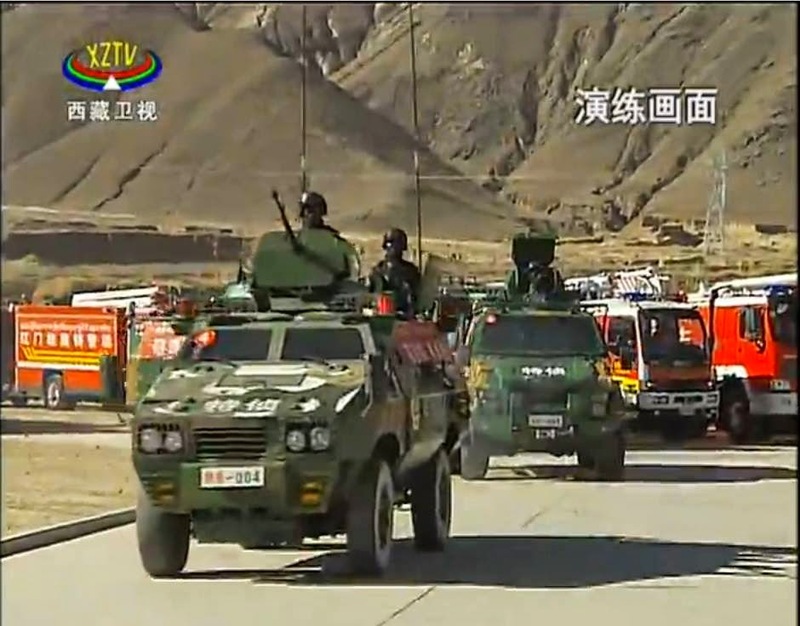 Yesterday on this blog, I mentioned two roads (today highways) which in the 1950s changed the military and strategic stakes on the plateau (the Qinghai-Tibet and the Sichuan Tibet highways). 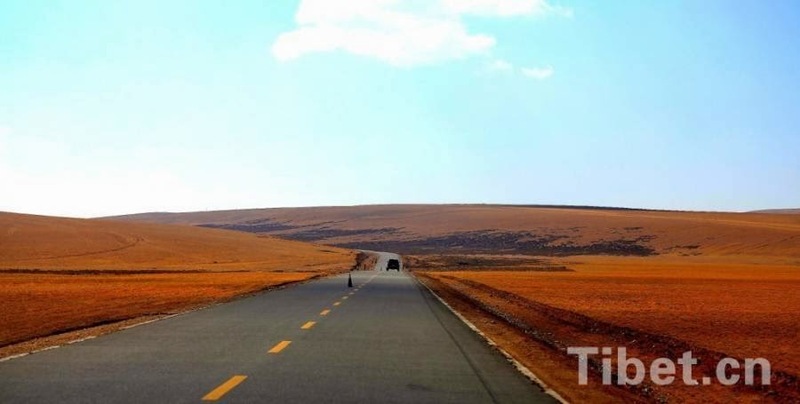 The newspaper quotes Wang Shuangjie, Party's chief of the CCCC First Highway Consultants Co., Ltd., a technical consultant for the planned project, who affirms: “Technically, we have the confidence to build the Qinghai-Tibet Expressway." 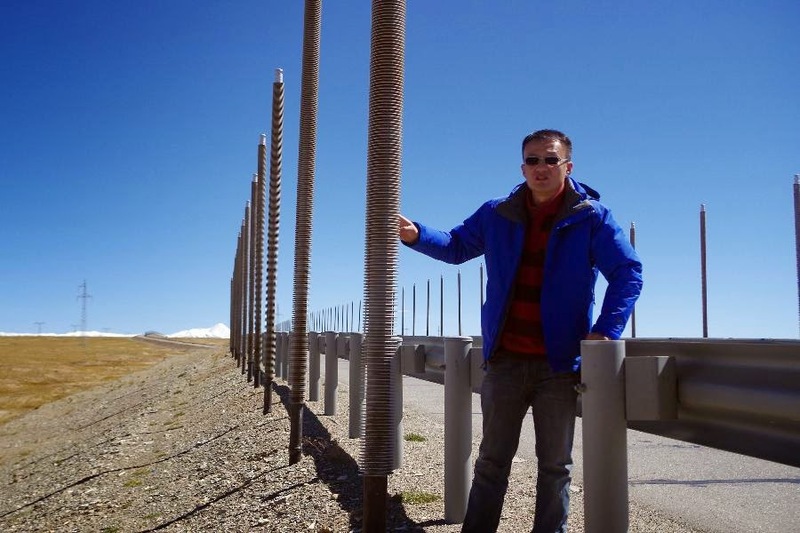 Wang and his team believe that the main technical barrier lies in the 500-km frozen earth belt along the planned 1,900-km expressway that links Lhasa with Qinghai’s provincial capital Xining. The Chinese engineers are aware of the extreme conditions on the Plateau, i.e. high altitude, low oxygen content, strong solar radiation and freezing temperature, which are serious technical challenges for the expressway's construction. 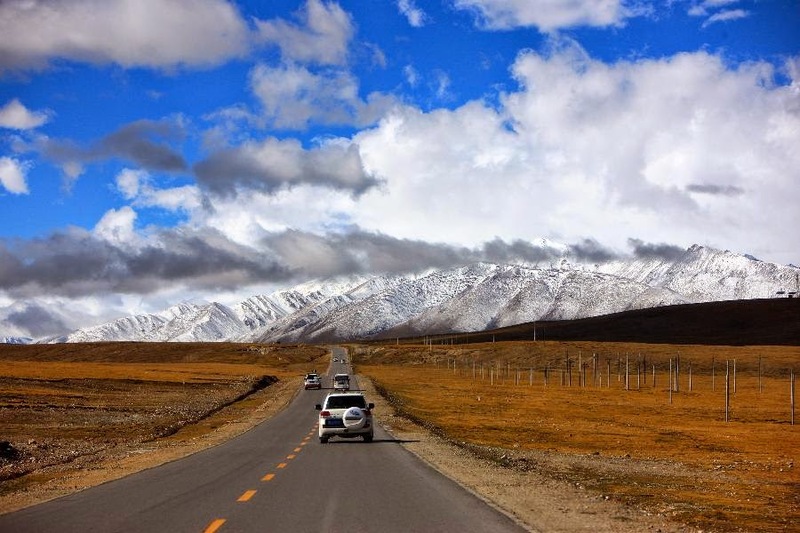 Wang said that the expressway will span over areas where the average altitude is above 4,500 meters and annual average temperature below zero. The China Daily believes that Wang and his team need also to address problems concerning the possible environmental consequences of the construction (melting of permafrost?) and come up with proper technology to take care of the fragile ecological environment. 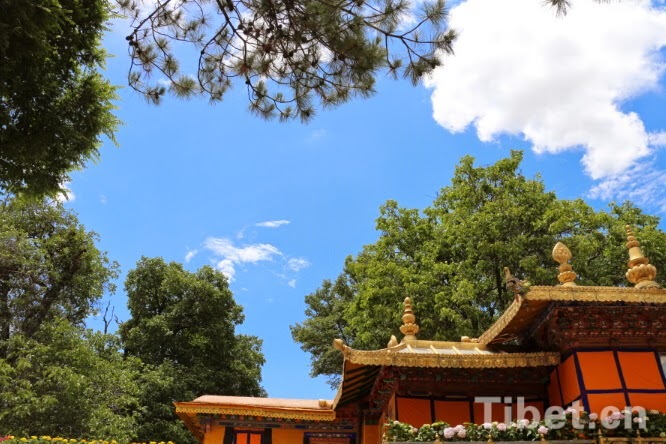 China Tibet Online says: “The abundant tourism resources and many famous scenic spots in the region attract more and more tourists to Nyingtri [Chinese Nyingchi] as their first stop for Tibet. In the first half year of 2014, Nyingchi totally received 836,200 tourists from home and aboard. This airport is located north of the McMahon Line. The Nyingtri Development and Reform Commission announced that, from January to September 2014, the Nyingtri/Mainling airport transported 246,611 passengers, up 17.5% from the same period in 2013. Meanwhile, the airport handled a total of 2,734 takeoff and landing flights and 961.8 tons of cargo, up 17.7% and 74.6% from 2013 respectively. Nyingtri/Mainling is the second largest (and lowest airport with an altitude of 2,900 meters) in Tibet. 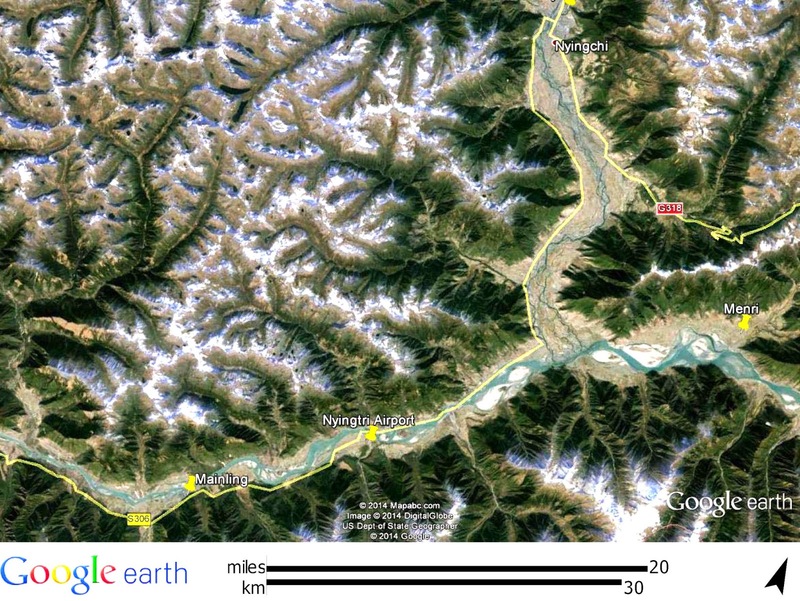 It is built on the banks of the Yarlung Tsangpo (Brahmaputra), north of the McMahon Line. The train to Nyingtri in 2020 will further exacerbate the border row. And then, the train to Chumbi Valley! Mr. Hong Lei should check his facts before making statements. Highways to Lhasa ...Kathmandu ...and India? 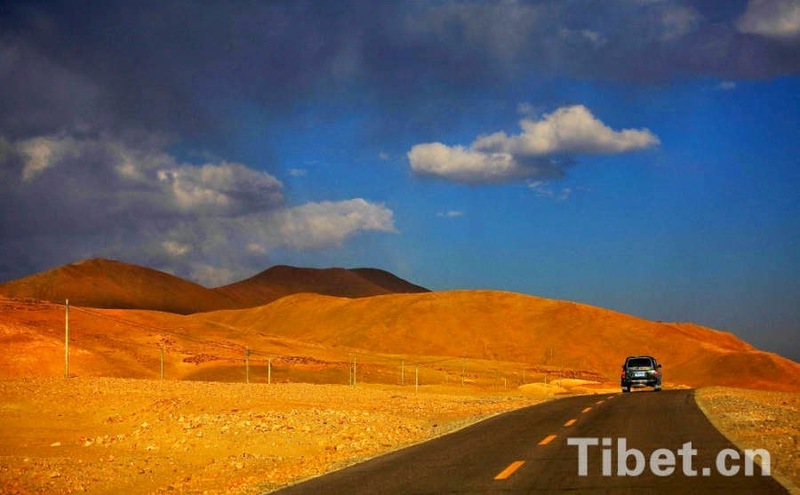 In the recent weeks, China has been 'selling' the ‘Sichuan-Tibet’ and the ‘Qinghai-Tibet’ Highways. 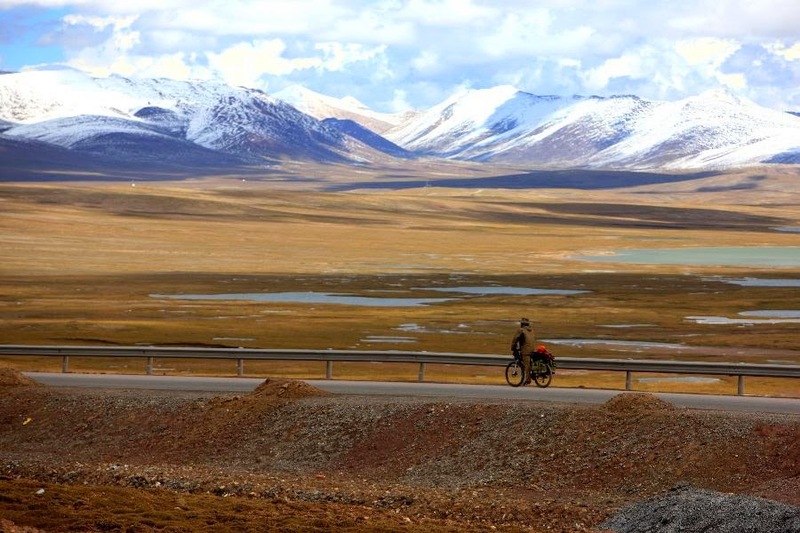 These road-links between Tibet and China have received a lot of media coverage. 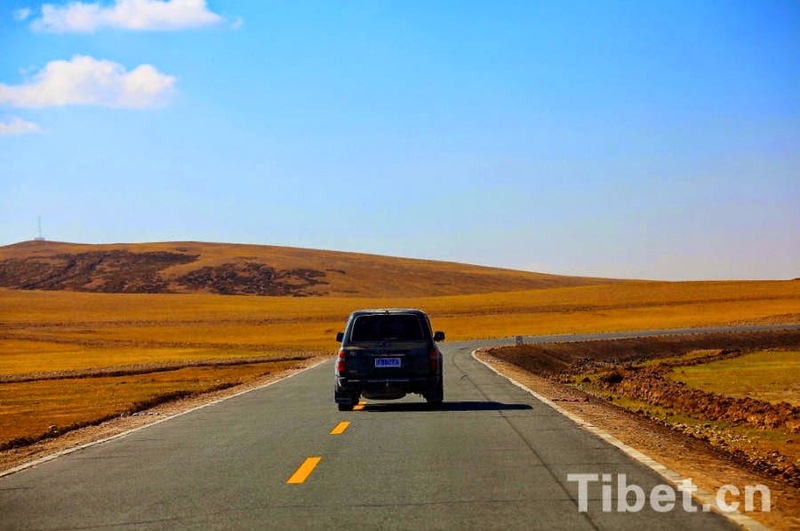 [It] is a high-elevation road starting from Chengdu, capital of Sichuan province, on the east and ending at Lhasa, capital of Tibet Autonomous Region [which was not existing in 1954], on the west. The highway has two routes. South Line has a length of 2,115 kilometers, while North Line is 2,414 kilometers long. 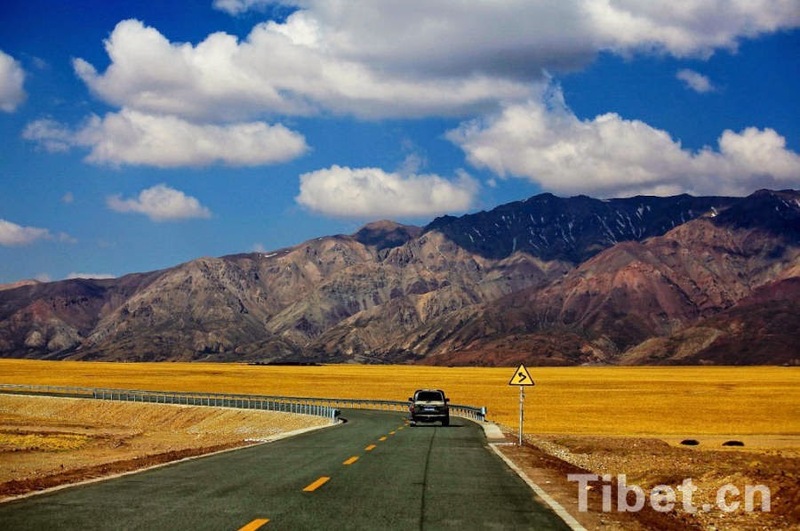 Construction of Sichuan-Tibet Highway started in April 1950, when the road builders cleaved mountains and controlled water, and finally opened for traffic on December 25, 1954, together with Qinghai-Tibet Highway. 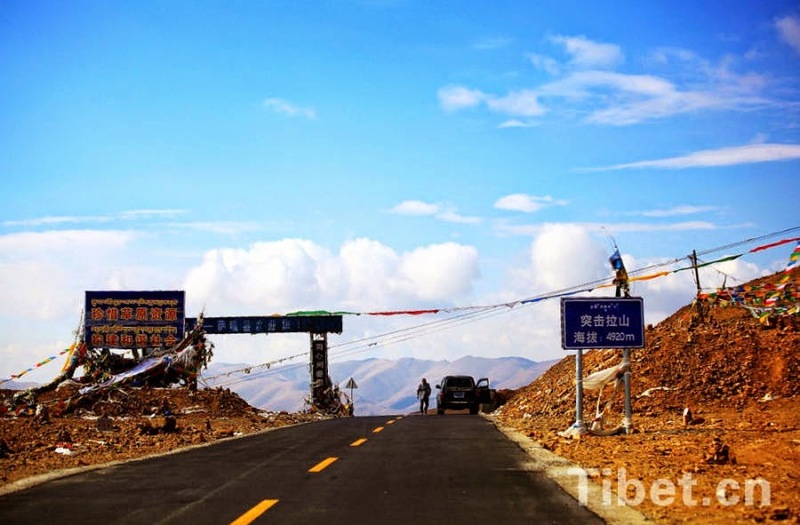 With high elevation and harsh geographical conditions, the building of Sichuan-Tibet Highway was an unprecedented challenge to Tibet's highway construction. 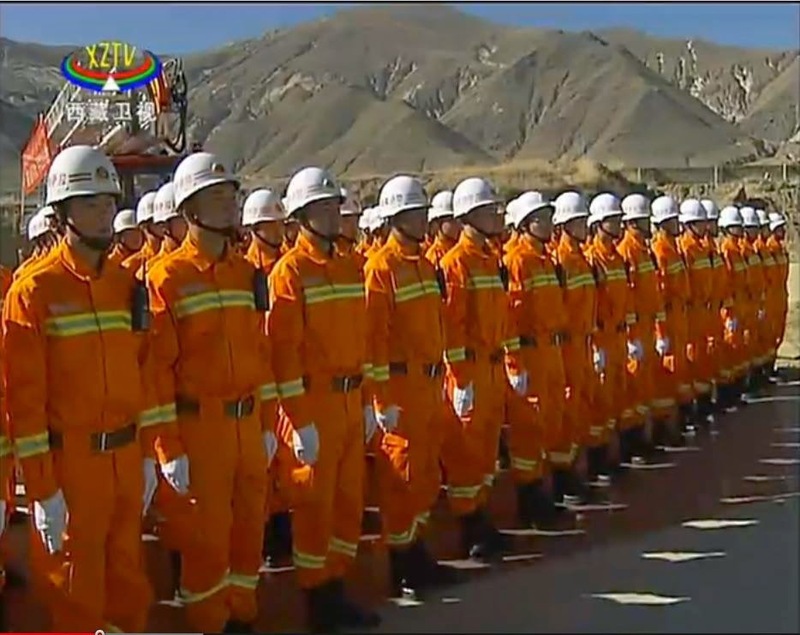 The Ya'an-Lhasa section covering a total length of 2,255 kilometers was completed on a high mountain range. Ya’an is located in Sichuan province on the Tibetan marches. Why were these roads (today, highways) so important? Today, it only takes a few days by bus. To understand better the situation, one should read the 1952 Annual Report from A.K. Sen, the India Consul-General in Lhasa. Without these roads, Tibet would have starved (like it did in 1952-53) and the Chinese occupation of the plateau impossible. 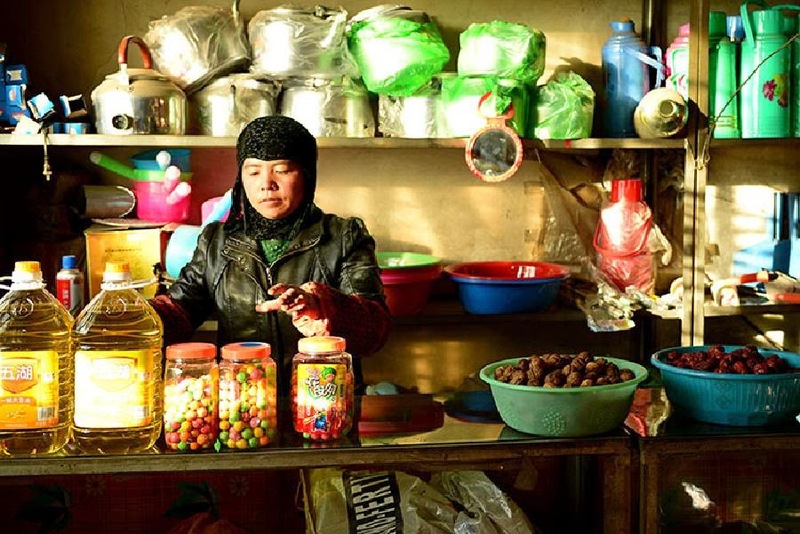 The inevitable economic distress in the wake of Chinese occupation was fast affecting the people’s livelihood. Food supplies became inadequate, prices soared up to astounding heights, even the poor man’s food – the tsampa (barley flour) – could not be easily procured. In short, the Tibetans, completely confused, failed to discern the various benefits that were to be derived from the liberation of their country. 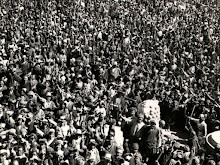 As a protest against the disastrous economic trends, the villagers round about Lhasa rose up as a body, probably inspired by some disgruntled monks who made an effort to oppose communist ideology, petitioned to the Kashag [Tibetan Cabinet] that the resources of the country not being enough to cope with such large concentrations of Chinese troops, they should be withdrawn from Tibet, leaving a small force as was maintained during the time of the Chinese Amban. The political implications of this appeal for the amelioration of people’s hardships, in that it demanded the reduction of troops, were seized by the Chinese to implicate the Prime Ministers as instigators of the move. Curiously enough, a day after the petition was presented an incident took place most conveniently which further helped the Chinese to assume a threatening attitude to deal with these ‘rebels’. Tibet had never witnessed a famine before. The only solution for Communist China was to expedite the construction of roads leading to Tibet (from Qinghai and Sichuan) in order to feed their occupying armies (to ‘liberate’ Tibet, in Communist jargon). The upshot was, the Chinese denounced the Prime Ministers to be anti-national, abettors of the rebels and uttering the most truculent threats to the Kashag that liberation of Tibet would be implemented by force if they failed to restore normal conditions by rounding up the malcontents, demanded the immediate dismissal of the Ministers as well. Having displayed such wrathful temper, they reinforced the Lhasa garrison by a couple of thousand troops and pointing their guns towards the Potala awaited the compliance of their command. Ultimately, the two courageous Prime Ministers, Lukhangwa and the monk Lobsang Tashi were forced to resign. It was the beginning of the end of ‘independent’ Tibet. Nobody had the courage to oppose the Chinese anymore in Lhasa. The resignation of the Ministers had to be accepted by the Tibetan Government on the 27th April . Next came the turn of the villagers’ delegates. 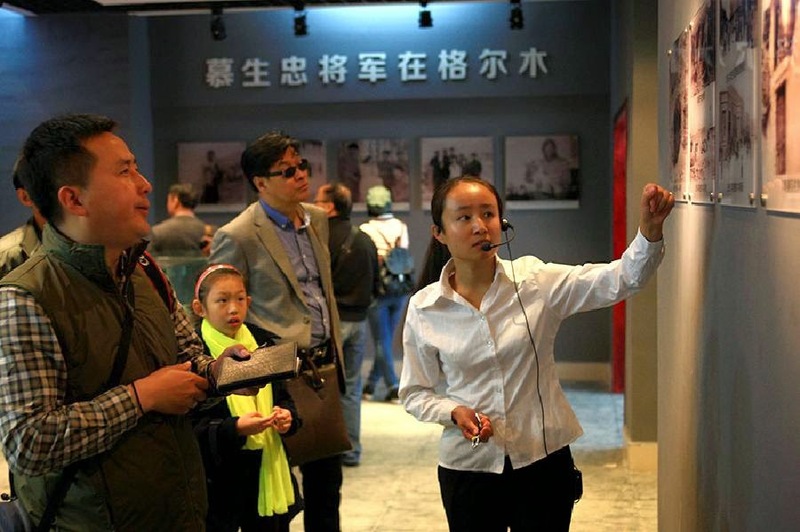 A special tribunal set up by the Chinese for trial of the six peoples’ representatives, passed judgement accusing them to be agitators, led astray by foreign agents. They and the public were warned that they had no right to submit ‘unlawful demands’ and that similar performances in future should not be repeated. The Tibetan Government issued orders to all Dzongpons to watch the activities of village assemblies. All meetings and careless political talks were banned. Thus with one adroit stroke the Chinese broke the backbone of Tibetan obstinacy. The Chinese, who had come to ‘liberate’ the ‘masses’ (with the cowardly support of many in the aristocracy), began punishing the ‘masses’ which had dared protesting. In the meantime, India started supplying rice to the PLA soldiers stationed in Tibet. 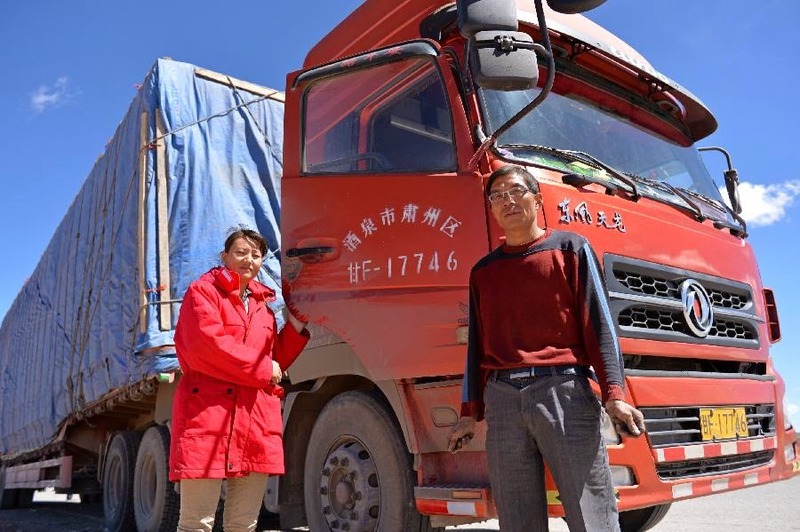 Quoting one Sonam, director of the Qinghai-Tibet Highway Management Bureau, the daily says: “More than 80 percent of goods still go via the highway, while people mostly take the train." The publication quotes Ma Jiali, a researcher of the China Institute of Contemporary International Relations, (Ma is also a well-known ‘India expert’ in Beijing); for Ma Jiali, the two highways are crucial for the national unity: "I think it's safe to liken the two highways to blood as they hold Tibet and the inland cities together. So, the running of the two highways, in a sense, has held the central government and Tibet together." But there is another aspect to it: these 2 highways (and a few years later, the Tibet-Xinjiang Highway cutting across the Aksai Chin), helped China consolidate its military position on the Tibetan plateau and by the end of the 1950s, Beijing was ready to take on India which had dared to give asylum to the Dalai Lama. Highways on the Plateau, let us not forget it, always have a strategic importance, though there are today extensively used for tourism development (but this too has perhaps strategic implications). More on the West, China Tibet Online reports that China is planning to open the Kyierong (Chinese: Gyirong) landport to the outside world in October. In clear, China will pour millions of tourists in Nepal, which has a mostly unguarded border with India. No need to explain the danger for India’s security. 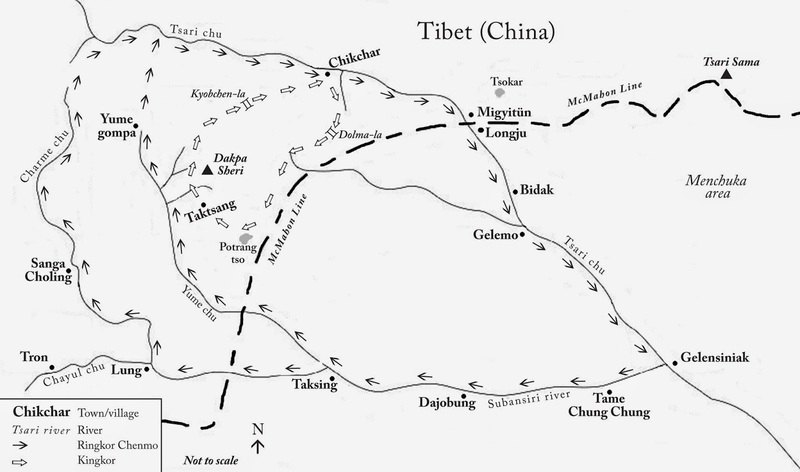 ‘War road’ refers to the Manchu invasion of 1792.
the Kyirong Ditch was the only way which must be passed in the ‘ancient road connecting Tubo [Tibet] Kingdom and Nepal when the pedestrians headed for Nepal from Lhasa. 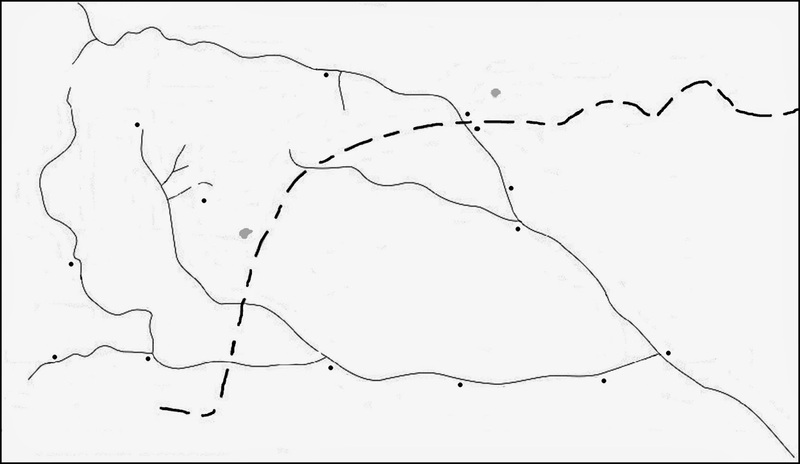 The ancient road an important channel for the culture and trade exchange of central plains and South Asia. 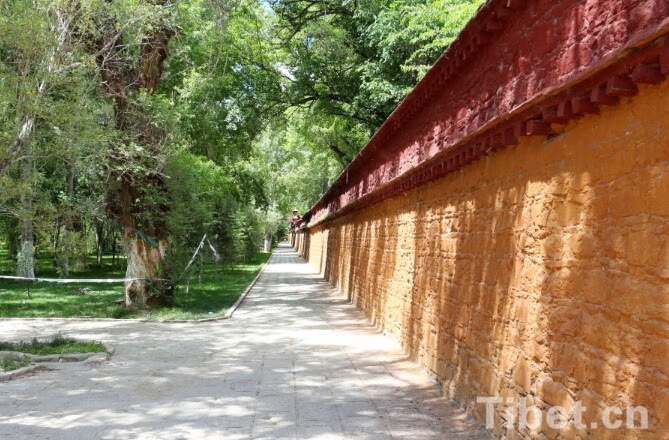 In history, this ancient road had welcomed Princess Bhrikuti from Nepal who married Songtsen Gampo …as well as Shantarakshita and Padma Sambhava who both went to Tibet for preaching Buddhism. It sounds great ...for the Chinese tourists. It is indeed a very dangerous development for the security of Nepal ...and India, because once millions of Han ‘tourists’ arrive in Kathmandu, they will be only one step away from India. Who will monitor the whereabouts? Certainly not the Nepali government, which is only too happy to harvest a few Yuan more from the Chinese tourists. 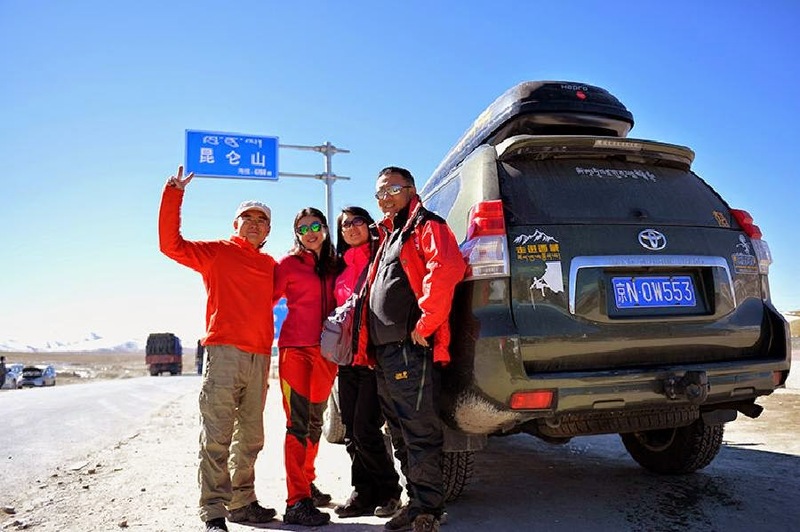 Here are some recent photos of Chinese tourists on the Qinghai-Tibet highways. My article (Edit Page) entitled Makings of a serious mass movement appeared yesterday in The Pioneer. On October 1, the People’s Republic of China’s founding day, Zhang Xiaoming, director of Beijing’s liaison office in Hong Kong, told the media with a smile, “The sun rises as usual”. This was an indirect comment on the Occupy Central movement in Hong Kong. Is it only wishful thinking from Beijing? Three days later, Xinhua published an article accusing the Western media of carrying biased articles on the recent protests in Hong Kong and “promoting democracy”. The Chinese news agency writes that the Occupy Central movement in Hong Kong is one example of the West’s partiality. 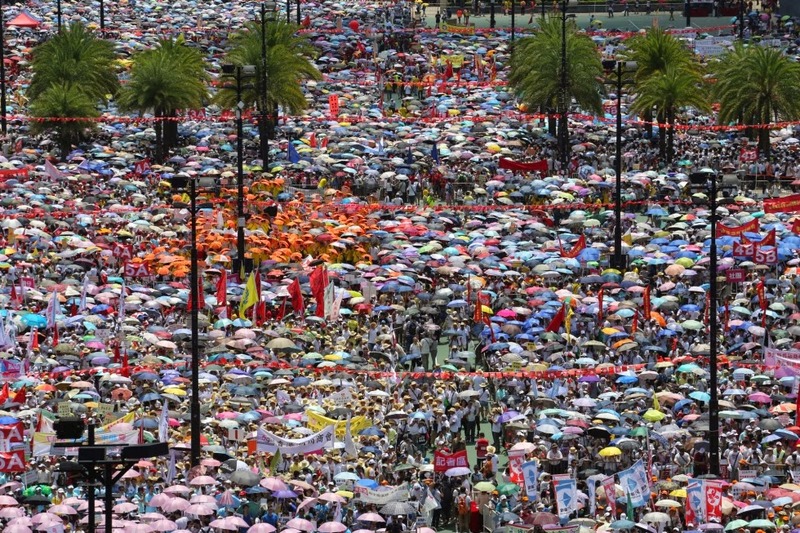 The article blasted the US “for providing media and financial support” to the protest movement; it further warned that, as the “color” revolutions in Egypt, Thailand, Libya, and Ukraine, all assisted by the West, ended up in domestic chaos and social turmoil, a “Hong Kong Spring” would inevitably lead to a similar situation. Nobody can deny that the change of regimes in the above examples brought instability to their respective countries, but there is another side to the coin. First, contrary to what Beijing believes, democracy does not belong to the West or the United States; it is a universal value practised the world over (though not in China as yet). India practised it since times immemorial. Was not Suddhodana, the Buddha’s father the ‘elected’ raja of the Sakyas? The small republics of northern India were ruled in a ‘democratic’ way, long before the US existed, so why always associate democracy with the West. Then, the Indian experience shows that democracy can deliver a strong and decisive leader who, with the backing of the masses, can lead the nation. Beijing should have noticed this when Mr Xi Jinping visited India! Recently again, President Xi Jinping dismissed the notions of ‘Western-style’ political reform for China and affirmed the importance of one-party rule for China. One can however seriously ask: Can the scheme, ‘One Country, Two Systems’, work? Can there be ‘Two Chinas’? One communist and the other democratic? This question is crucial not only for China’s future, but for Tibet, Xinjiang and Inner Mongolia too, aspiring to ‘another system’, if not a separate country. Let us look at the recent ‘pro-democracy’ incidents in Hong Kong. During the ongoing Occupy Central movement, tens of thousands of Hong Kongers have taken to the streets in the former British colony to pressure Beijing to keep its promises. The latest news is that Hong Kong Chief Executive Leung Chun-ying has appointed his deputy Carrie Lam to lead a team of senior officials to meet with student leaders. Though the pro-Beijing leadership affirms that the students’ protests are dwindling, talks are on for ‘reforms’. What will happen if the police uses riot gear, teargas or rubber bullets tomorrow or in the future? 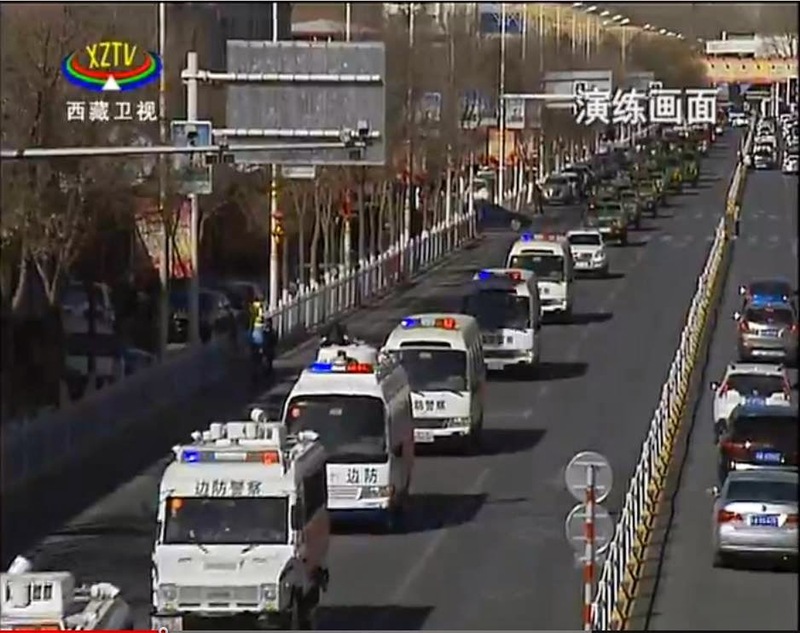 The police will not be different here than in Tibet or Xinjiang. Can it use another ‘system’? It probably cannot, and the younger generation in Hong Kong is certainly not ready to become another of China’s ‘minorities’. When, after years of negotiations, the UK returned Hong Kong to China, the colony was promised “a high degree of autonomy” for the next 50 years (similarly, the Dalai Lama today asks for a “genuine autonomy” for Tibet). The former British colony came under ‘One Country, Two Systems’, which supposedly guarantees freedom of speech, of assembly and of religion and a free press. All this is enshrined in the Basic Law, which governs Hong Kong since 1997. But in 2004, Beijing warned that it would have to “approve” of any change to Hong Kong’s election laws. Today, the pro-democracy activists believe that, in ‘One Country, Two Systems’, the second part of the promise is more important than the first. This is not the case with Beijing. When Mr Leung announced that the nominating committee will be modelled on the existing election committee, loyal to Beijing, which selected him in 2012, former Hong Kong Governor Chris Patten said that Beijing was not keeping its commitments “by hiding behind flexible legal language”. On August 31, the National People’s Congress had asserted that only after approving candidates, would it allow direct elections in 2017. This brought the differences between the different parties to the fore; candidates for Chief Executive must gain the support of a majority of a ‘nominating committee’ (packed with Beijing supporters); further, only two or three candidates can contest. Beijing’s blessing is, thus, necessary. This is what worries Beijing: Another generation is ready to take over the struggle. Further, could there be another Tiananmen in the making despite the tight censure of Hong Kong news in the mainland? There is no doubt that if the ‘One Country, Two Systems’ model fails, it will have serious repercussions for other parts of China (particularly in Tibet and Xinjiang). And in Taiwan too, which has recently been offered a similar scheme (though Taipei immediately declined). In April 1989, the Communist Party’s mouthpiece, The People’s Daily, published a front-page editorial denouncing the students on the Square, using the word “chaos”, a notion violently objected to by the students. The same newspaper says now that Hong Kong would “fall into chaos if the protests were not dealt with according to law”. The Dalai Lama had said that he was quite certain that “international pressure” could force China to keep its promises. This does not seem to be the case today. Promotion and demotions in Tibet? 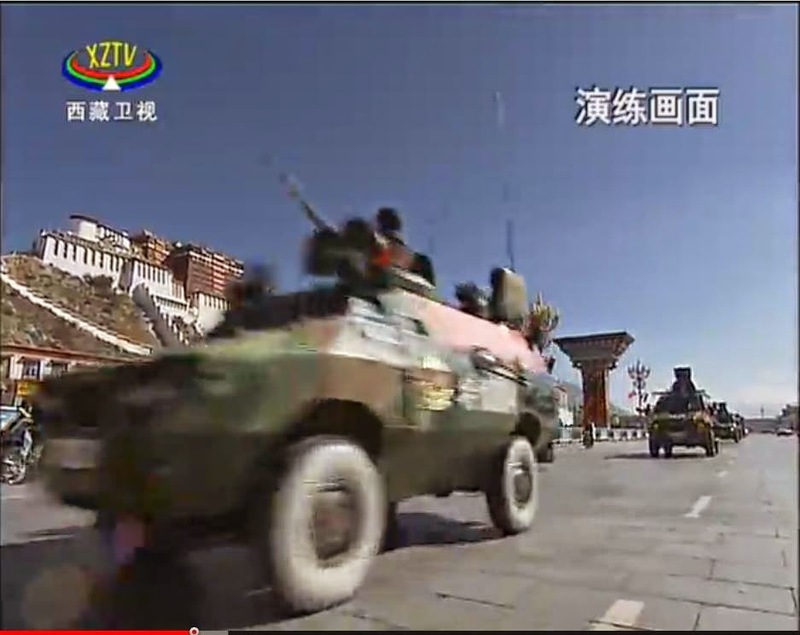 When I wrote yesterday's post, I was not aware that Lt. Gen. Niu Zhizhong, the Chief of Staff of the People’s Armed Police was in Lhasa, from where he made his announcement about the 'promotion' of the PAP's political commissar in Tibet. Nui was received by Pema Thinley (alias Pema Choling), the Chairman of the TAR’s People's Congress (and senior most Tibetan in the Party). Deputy secretary Wu Yingjie (also vice chairman of the TAR) and the powerful secretary of Politics and Law Committee, Deng Xiaogang were also present. Lt. Gen. Niu Zhizhong briefly described the purpose of his trip to Tibet; he expressed his gratitude to the regional party committee and the Tibet government for their support in the build up the People’s Armed Police Force; he also congratulated the Tibetan leaders for the region's achievements in terms of development and ‘stabilization’ of the region. He spoke of the long-term dedication of all cadres posted on the snow-covered plateau, and their work for the masses. 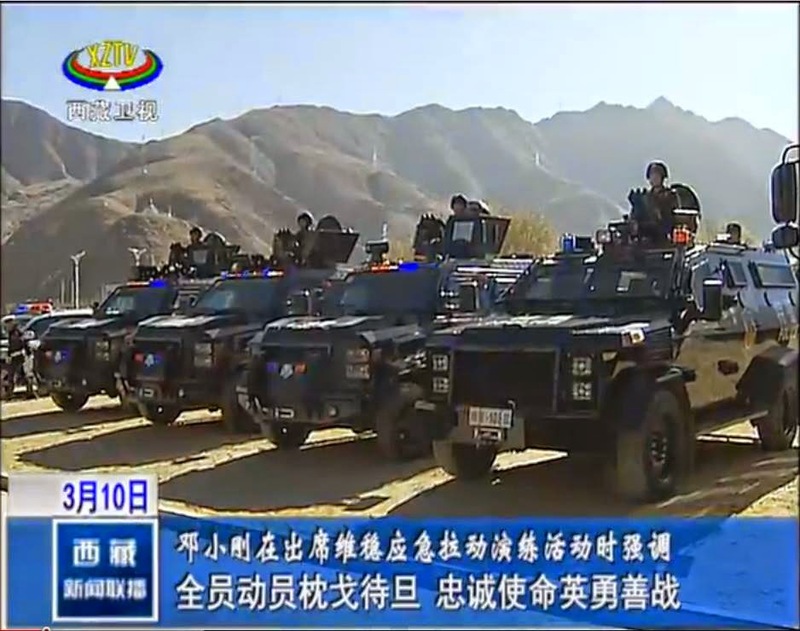 He said that Tibet Armed Police Force should continue to follow the Party's command (are they not always following?? ); they should serve the people in the fine heroic tradition; they should actively participate in the local construction, in order to build a well-off society and realize the great rejuvenation of the Chinese Dream (so dear to Xi Jinping). Nothing really new, except that the Commander of the Tibet Armed Police Corps Maj. Gen. Song Baoshan, and the Political Commissar of the Tibet Armed Police Corps, (now) Lt. Gen. Tang Xiao were in attendance. While Tang Xiao had just received his promotion, it is not the case for Song Baoshan who remains Major General. What a public insult for Song! A military expert told The South China Morning Post that "the commanding officer of Tibet’s armed police force is expected to be promoted to a rank equivalent to lieutenant general as well, because the commanding chief of an army usually has a rank at least equal to that of a political commissar." The issue is that Song has not been promoted. Well, it is one explanation. Let us first see if Song Baoshan is also promoted, he may not, in which case, 'experts' will have to find another explanation. Tibet: why is China so nervous? China is slowly but surely tightening its grip on Tibet. 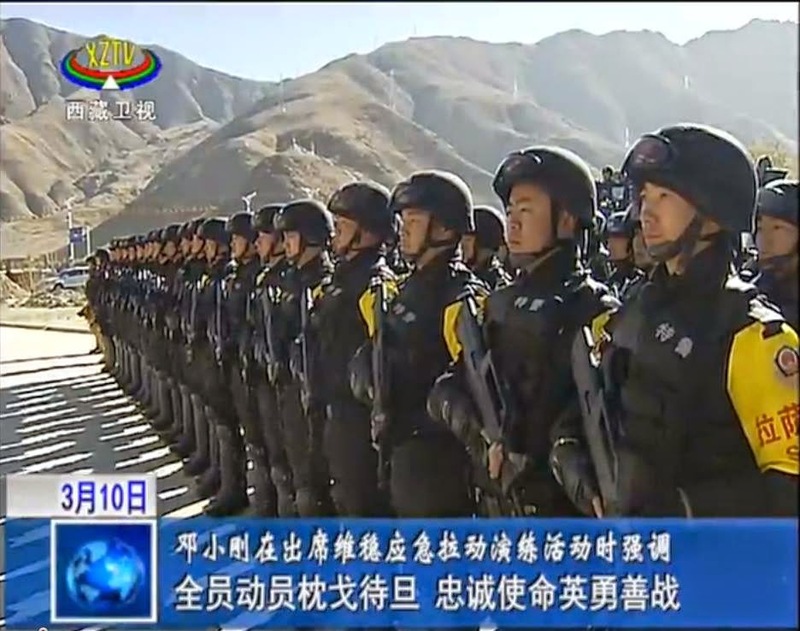 The latest sign is the 'upgradation' of the status of the Tibet Armed Police's Political Commissar. The Global Times yesterday announced : "China's Central Military Commission upgraded the political status of the political commissar of the Armed Police Corps of the Tibet Autonomous Region, indicating the central government's determination to safeguard regional stability". The Communist mouthpiece quotes 'experts'. Major General Tang Xiao, the Political Commissar of the Tibet Armed Police Corps, under the People's Armed Police, will now enjoy a new 'treatment'. He will be treated at par with the head of a corps-sized military body, (equal to that of officials at a provincial or ministerial level, according to The Global Times). 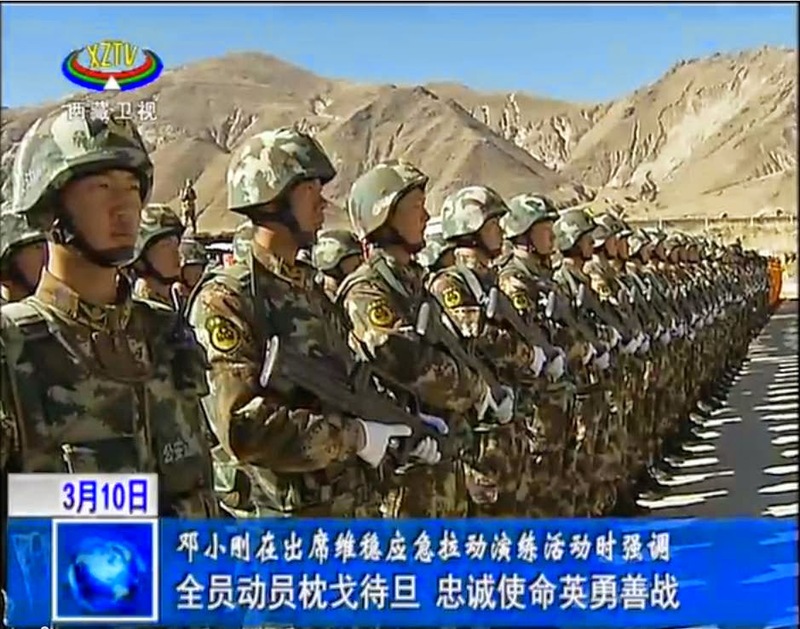 However, the Tibet Corps itself has not been upgraded. The Global Times explains to its readers: "Under the dual leadership of the State Council and the Central Military Commission, the Chinese People's Armed Police is composed of internal security forces and various police forces, including border security, firefighting and security guard units." Niu Zhizhong, Chief of Staff of the PAP announced Tang's promotion at a press conference on October 3. 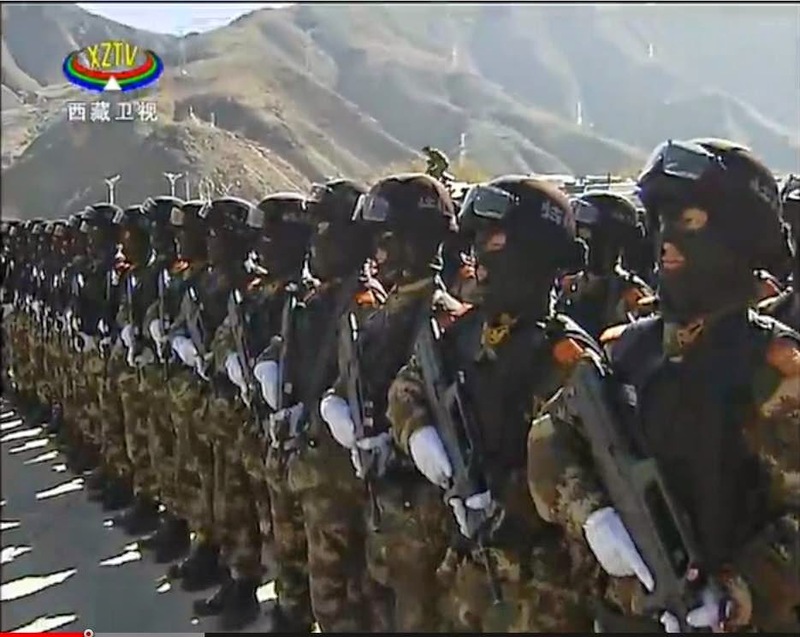 Niu said that 'better treatment' for the head of Armed Police in Tibet "is a major decision made by Central Military Commission based on the special environment and strategic position of the Tibet Armed Police." The objective of Tang's promotion is to better safeguard regional stability. Song Zhongping, a Beijing-based military expert told The Global Times that: "It is not unusual that heads of certain military bodies, which are usually located in strategically important areas or suffer from harsh living conditions, are given certain benefits through their 'treatment' being improved." 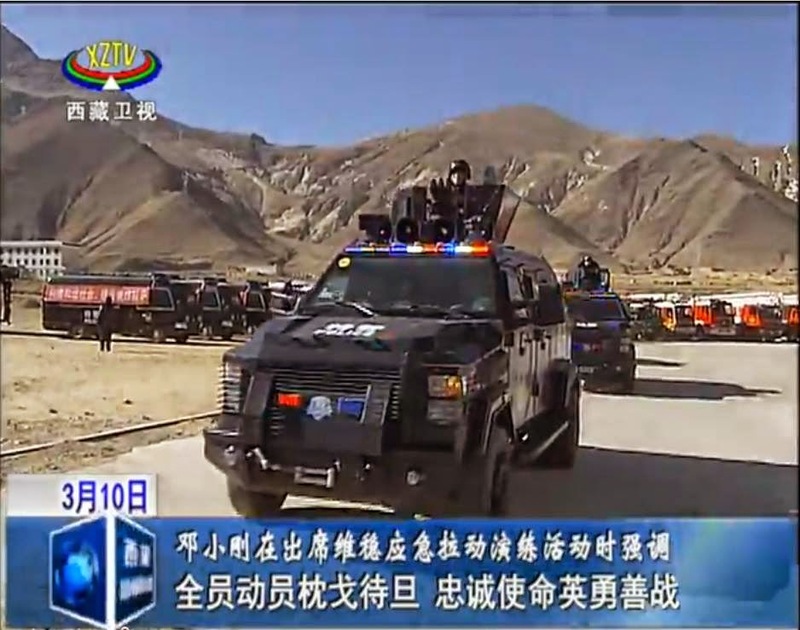 One online commentator said that it is an official announcement of the militarization of the People’s Armed Police in Tibet. The commentator explained: "Tang Xiao took over as political commissar of the Armed Police force in the Tibetan autonomous region in September 2013 after being promoted to the police rank of major general of the Armed Police in Tibet in July, 2010. With the October 3, 2014, announcement, Tao Xiao now has official military rank and receives regular military salary. " Nothing has been said about the PAP Commander in Tibet, Maj. Gen. Song Baoshan. Why to promote the Political Commissar only? Let us also not forget that General Wang Jianping, the PAP's Commander is an old Tibet-hand. Already in July, The PLA Daily had announced that People’s Liberation Army (PLA) had made intensive human resources (HR) adjustment. It was said that the emphasis was laid on the capability demonstrated by the officers: "it indicated the great importance attached by Xi Jinping to practical capabilities of military officers." China Military Online then reported: "At least 3 of the newly promoted officers have received relevant training in Russia after China and Russia resumed military exchange in 1996, and some of them obtained real war experiences in the China-Vietnam border war at the end of 1970s. This fully demonstrates Xi Jinping’s style of promoting people “who can fight and win battles”. Two of the Major Generals promoted Lieutenant Generals on July 15 were Xu Yong and Diao Guoxin, respectively Commander and Political Commissar of the Tibet Military District; both participated in the China-Vietnam border war. Though that was long ago, the Chinese insist on the experience 'acquired' (they must have been 2nd Lieutenant then)! 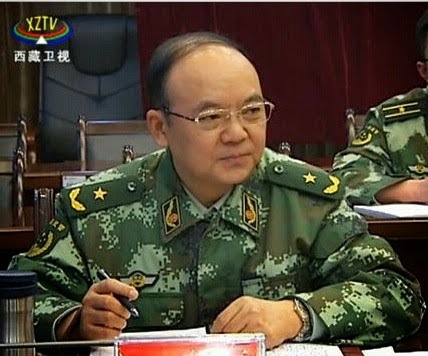 The PLA website added: "The 55-year-old Xu Yong is quite young among the newly promoted military officers this time. During the Wenchuan earthquake in Sichuan in 2008, which caused the death of 87,000 people, Xu Yong was the first PLA major general that led his troops to participate in the earthquake relief." This has already been mentioned on this blog. In the meantime, the civil administration also works hard to ‘stabilize’ Tibet. Deng Xiaogang, the Deputy Secretary in charge of security went on an inspection tour in Lhasa to "check security measures taken during the holiday season and the implementation of the anti-terrorism plan”. 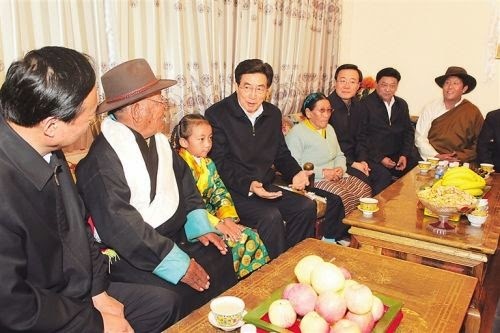 He met ‘festival staff’, representatives of the regional party committee, government officials, and on behalf of Chen Quanguo, the Party boss, he lectured them all about the importance to work hard for maintaining stability of Tibet. Deng, who was accompanied by Lhasa Party Secretary Choedrak and other Party officials, went to Lhasa railway station, to the bus station, where he checked that the Party Standing Committee’s stability maintenance measures have fully been implemented. He talked to police officers, staff on duty, security personnel and ask them to strictly and meticulously follow the security procedures in order to assure smooth and orderly passenger's transport, stability and harmony. 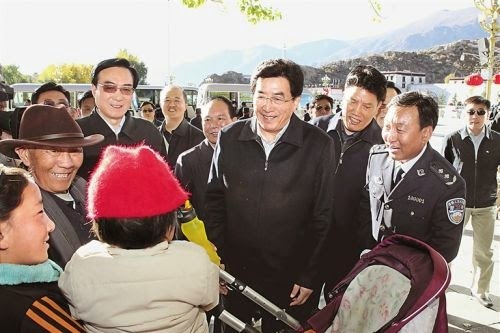 It seems that Deng Xiaogang very pleased but what he saw; he told the security officials that the current social situation in Tibet is generally stable, but the situation is still complicated. Tough anti-terrorism, stability maintenance measures are still required. The forces must remain vigilant and 'tighten the string of measures to maintain stability'. Deng added that everyone should continue to carry forward his duties without fear or fatigue, always remaining on high alert, taking strict precautions according to the regulation to crack down on various criminal activities. Security staff must consolidate the harmony and stability in the Tibet region. Why is China so nervous? Do they fear the contagion of Hong Kong? 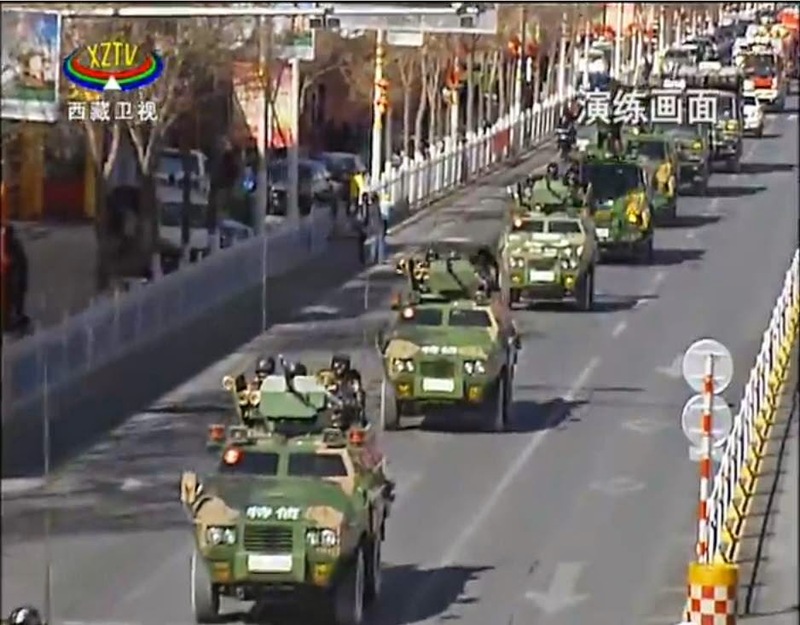 Show of force of the PAP a few months back in Lhasa.